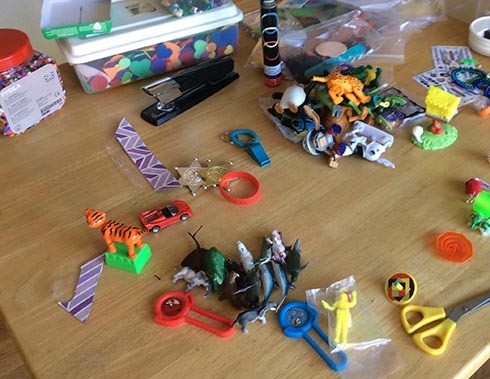 When my husband and I married, we combined the accumulated goods of two adult lives. My goods included a set of metal, screw-together shelves that shimmied and bowed when books were stored in them. The metal shelf theme was complemented by a sheepskin rug I’d purchased at CostCo, under the mistaken impression that it would make a room with metal shelves romantic, and a hand truck whose tires eternally went flat and stank up one of my closets. His household included a battered bedroom set with intricate carving and extremely shapely Queen Anne legs. The set was so effeminate that when I visited his apartment for the first time, I was startled. “What interesting furniture,” I said uneasily, then chastised myself for the bigoted stereotypes that were racing through my brain. “No,” he said, then he spun a complex tale of the set being abandoned at his place by the mother of a part-time stripper and the paramour of a fellow who frequented a car restoration shop on a street nicknamed “Methanol Alley”. “So-and-so was dating her daughter. 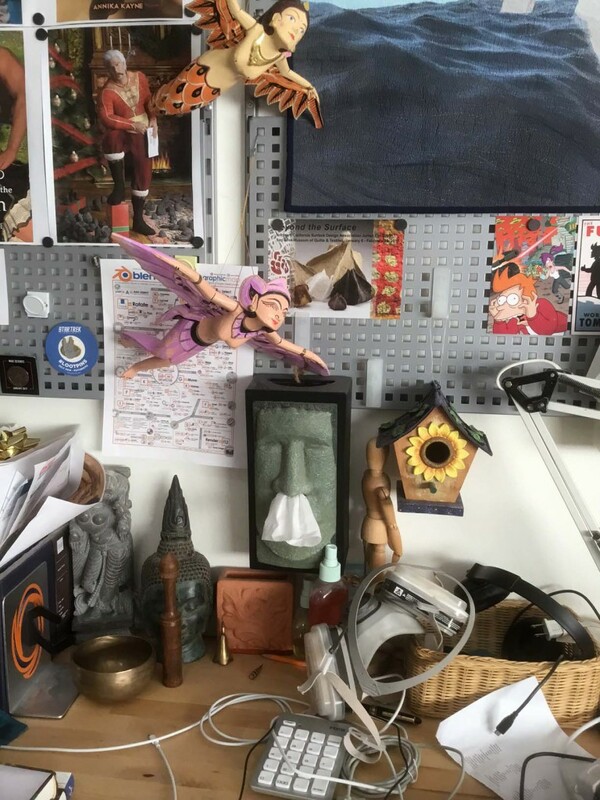 The set was better than cardboard dresser I had in Flint so I kept it,” he finally concluded. I came away utterly bewildered. How had the bedroom set wound up in his home? Why did it matter that the woman’s daughter was a part-time stripper? Where on Earth did one find dressers made of cardboard? Perhaps some mysteries are best left unexplained. His bachelor dowry also included a worn set of end tables which, he proudly declared, had been in terrible shape when he purchased them. Their condition had not improved with age. I didn’t own any end tables, so they were a welcome addition to the marital household. They were battered and hideous, but so what? 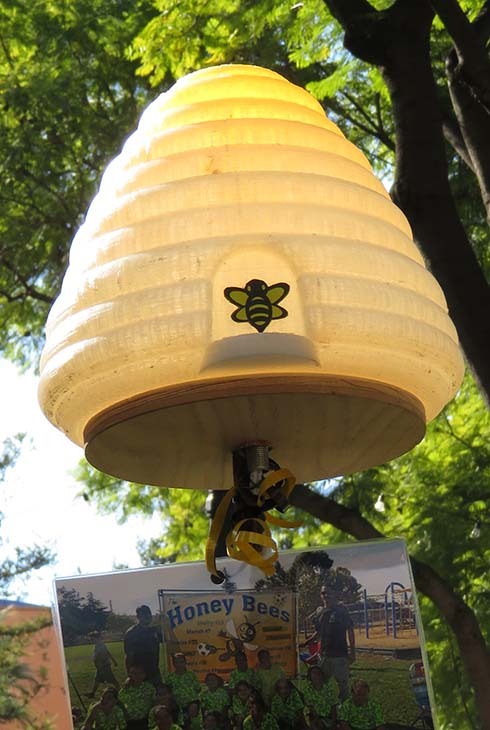 They still did an admirable job of supporting lamps, plates filled with stale pizza crusts, and stacks of overdue library books. Besides, we soon faced more pressing issues than ones of appearance: a baby with deep-seated objections to sleeping and pets who liked to empty themselves on the couch. As the baby grew older and transitioned into boyhood and tweenhood, the fact that the tables were battered even seemed like a positive. At least we didn’t have to worry about furniture getting banged up when feral packs of boys visited! Kids could spill things, put their feet up, or even stand on the furniture and do the Macarena. Nothing they did would make the place any worse. If their parents found the tables low class or didn’t let their children visit, so much the better. Then, all at once, I grew weary of the worn surfaces. One day I approached my husband and asked how he’d feel about my refinishing them. It was a delicate matter. They were heirlooms, after all; one couldn’t get a patina like that on furniture overnight. No, those surfaces had history. They spoke of repeated assaults from ocean waves penetrating shipping containers, lonely cats sharpening their claws, and spilled beer soaking into piles of questionable magazines. Art tables. I had no idea how to make art tables, not that I’ve let lack of knowledge or common sense hold me back before. At some point during the questioning, I realized that he really and truly wasn’t that worried about the matter. I also realized that I didn’t want to invest much energy or money in creations that might get wrecked. These were tables, after all, not artworks we’d hang on a wall. Whatever we did to them, they were still fated to hold books and glasses of iced tea. That was how I found myself bellying up to a copy of Filter Forge, a program for creating Photoshop-compatible filters. With over 12,000 filters already available for use, I figured one of them would work just fine for designing fabric I could decoupage to the tops of the tables. That would give the tables a colorful, painterly look without too much effort on my part. It would also help disguise any imperfections in the surface that remained after sanding and filling. One could simply purchase fabric from a store. However, I opted to design the fabric myself. I tackled that first, since there can be a lead time of a couple of weeks for fabric to be printed and delivered. While the fabric is being made, one can move on to other tasks. They were bright and modern, in keeping with our art-filled mid-century house. I did find them a bit garish at first – I believe the statement I made to my husband was “Good lord; these make my eyes bleed”. However, he encouraged me to give them a try. I’m glad he did. I’ve since come to love them. They now seem cheerful and lively rather than obnoxious. Perhaps that’s because the effect of a bright, large-scale print is moderated when used on accent pieces or a small area. Notice that I created two designs, not one. I could have simply had two identical lengths of fabric printed, one for each table. However, I knew that if I did that and couldn’t get the fabric aligned exactly the same way on each table, it would drive me nuts. Maybe nobody else would know, but I sure would! With two similar but different panels, they don’t look “wrong” if the tables are juxtaposed. While the fabric was being printed in Durham, North Carolina, I prepared the tables for painting and decoupage. 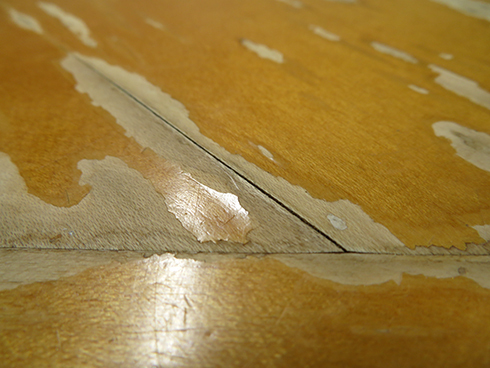 Here’s one of the tables in its original state. 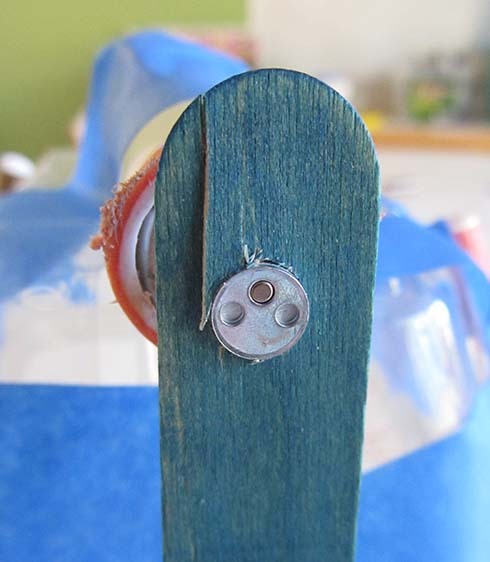 The tops of both had quite a bit of wear and damage, so they required sanding. 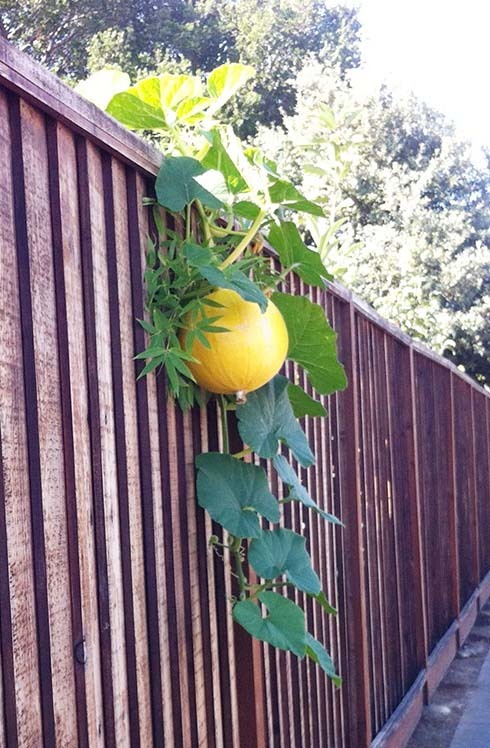 If one has teenagers handy, they make a convenient source of labor. 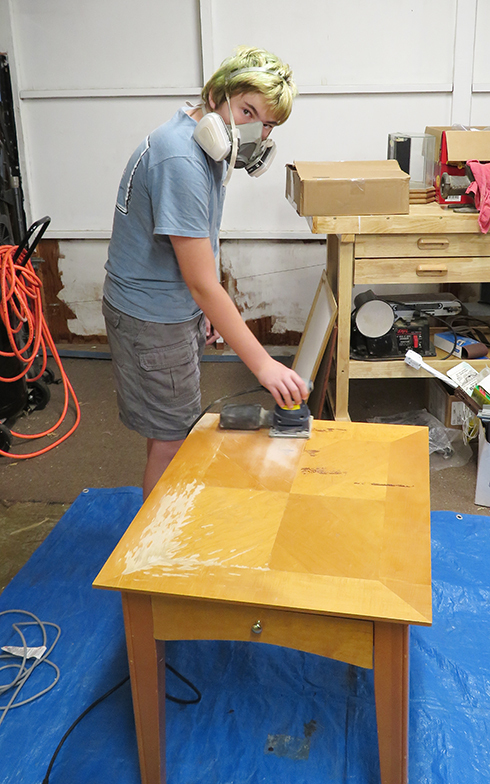 I later disassembled the tables to make it easier to sand all of the components. 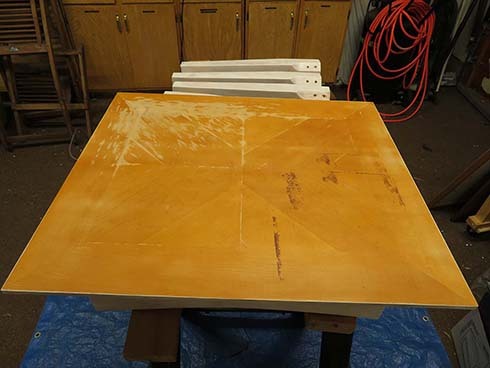 Yes, if one has a surface that is actually wood, or is veneer in reasonably good condition, one can simply do a light sanding and apply varnish or another protective coat. I like the look of wood, so I would have preferred to do just that. 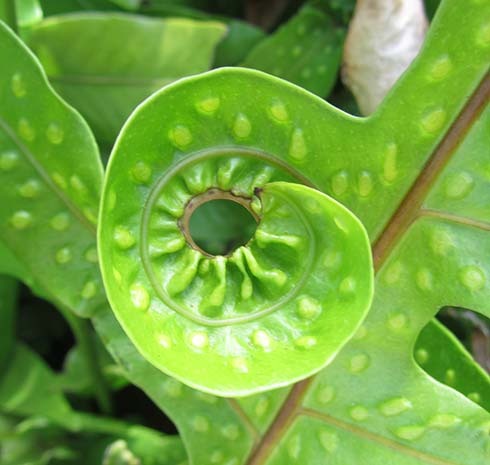 In reality, the aprons and tops are veneer-topped composite. The veneer was peeling and had chipped away badly. 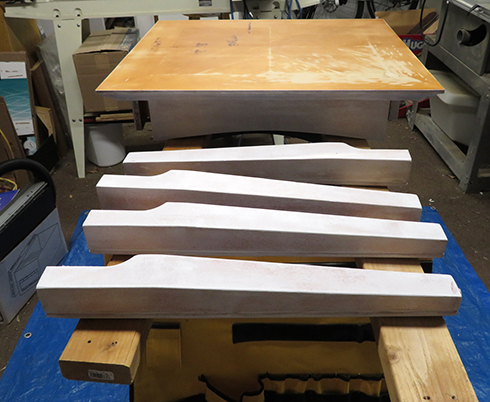 One could order sheets of veneer, painstakingly trim them to shape, and glue them in. I am not that dedicated and, as my husband stated, repairing the veneer would cost more than he paid for the tables to begin with. That’s a bit of an exaggeration, but it’s still on point. 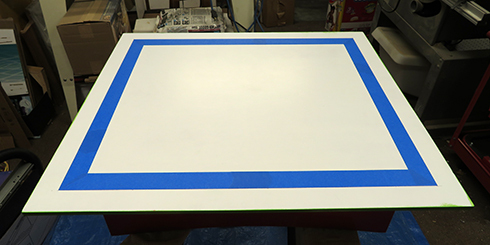 I opted to apply filler, sand the tables, and prime, paint, and decoupage. One of the table tops after sanding and applying filler. The surface is smooth now, if visually unattractive. Here’s one of the tables after disassembly. The legs have been primed in preparation for painting. I used Zinsser Bulls Eye 1-2-3 Primer, which was mentioned in this article on painting furniture. 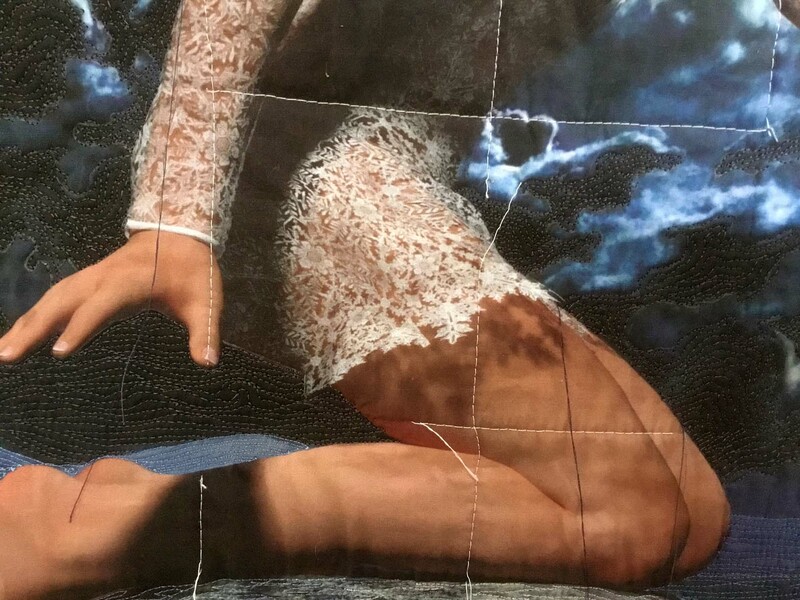 At this point, the fabric had been printed and shipped to me. I took it to a craft store and chose several bottles of acrylic craft paint to match. 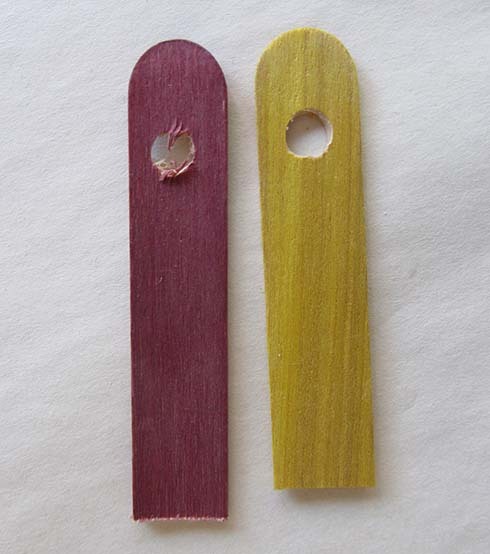 One could also have paint custom-mixed at a paint store or lumberyard. I opted for craft paint because it’s dirt cheap, available in a wide range of colors, and I don’t have to beg a store employee to mix it for me. Acrylic paint is nice because it can be cleaned up with water. I keep a bucket filled with sand outside my back door, so I can empty rinse water into it rather than down my drain. 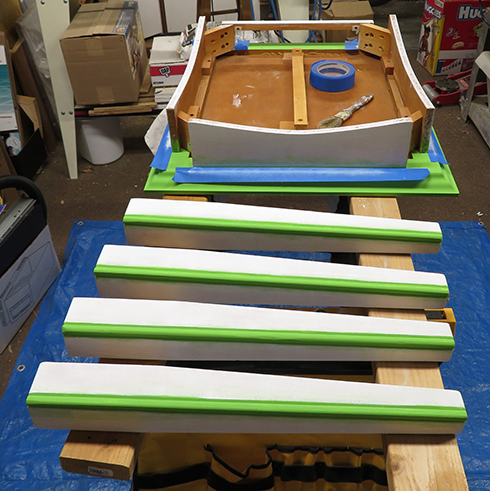 The table legs, after painting green stripes down the edges. I quickly abandoned that idea in favor of painting the legs a solid blue. I simply couldn’t get the edges of the stripes crisp enough for my taste. One of the table tops after being primed. 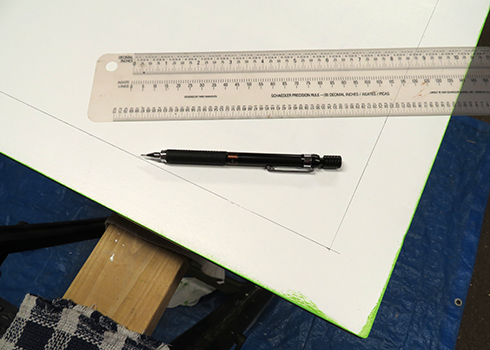 The pencil outline is in preparation for painting a green border around the edge of the table. I wanted a painted border around my fabric, rather than running the fabric all the way to the edges of the table tops. However, since the tint of the paint is visible through the fabric, it was important to have a white background in the center so the fabric would be as bright as possible. 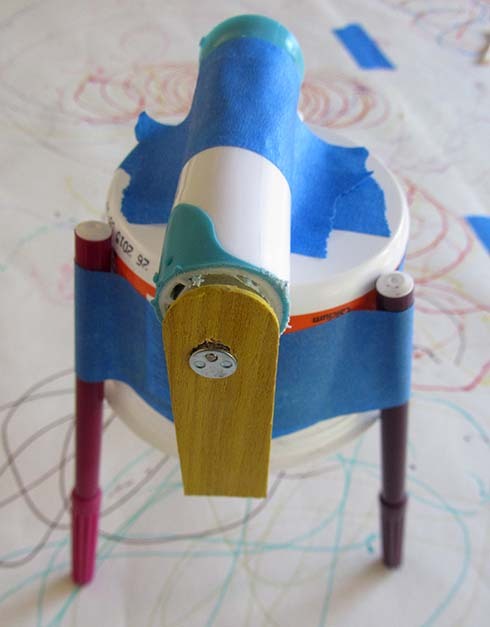 Painter’s tape applied along the pencil marks. 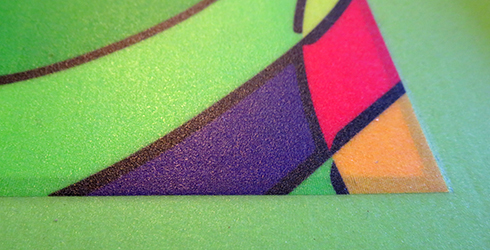 The tape kept the edge of the border nice and crisp while protecting the white background in the center. Sorry; I neglected to take a photo just after I’d painted the border. 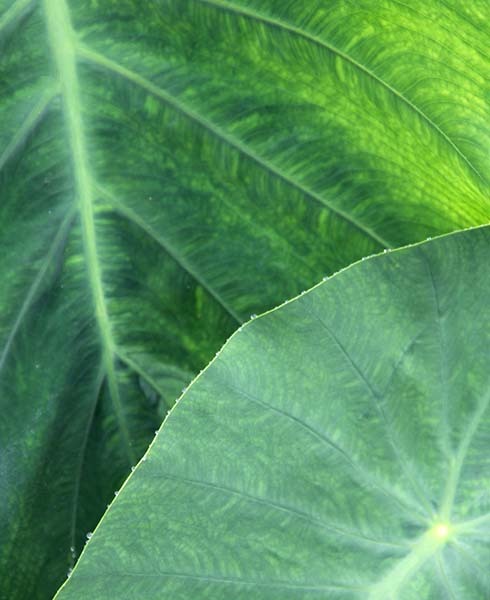 Pretend that white section around the edge is green and you’ll know what it looks like, though. 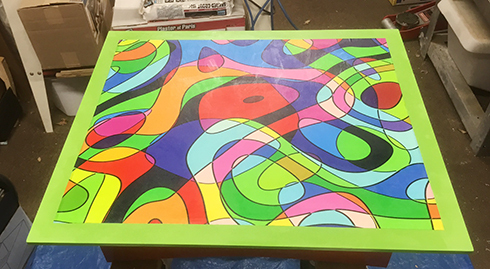 I painted the legs, drawer front, and other sides of the table top as well. I also purchased and painted plain wood knobs for the drawers, so that they’d match. 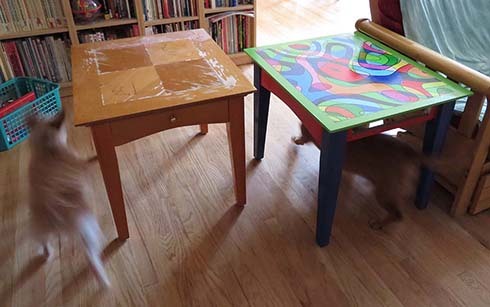 I’d never decoupaged furniture before, so I consulted this article. It recommended using Mod Podge, a traditional decoupage medium that’s available at most craft stores. The fabric is a little easier to work with if it’s impregnated with Mod Podge before applying it to one’s surface. (A tip I learned here.) The Mod Podge prevents fraying and makes the fabric easier to handle and position. 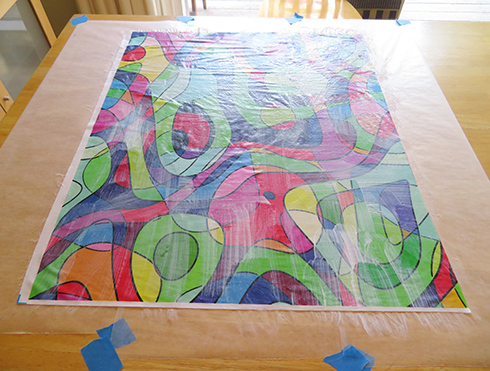 To prepare the fabric, start by taping a protective layer of waxed paper to your work surface. Lay down the fabric and apply Mod Podge to one side. After the fabric dries, flip it and apply Mod Podge to reverse side. Allow the Mod Podge to dry thoroughly before moving or cutting the fabric. I found that I had a few crinkles in my cloth after this process. However, I was able to press them out by sandwiching the fabric between lengths of parchment paper or beneath a teflon sheet and using an iron at low temperature. Next, I cut the fabric so that it would cover the unpainted rectangle on my table tops, with a little bit extra to overlap the painted border by about 1/8”. 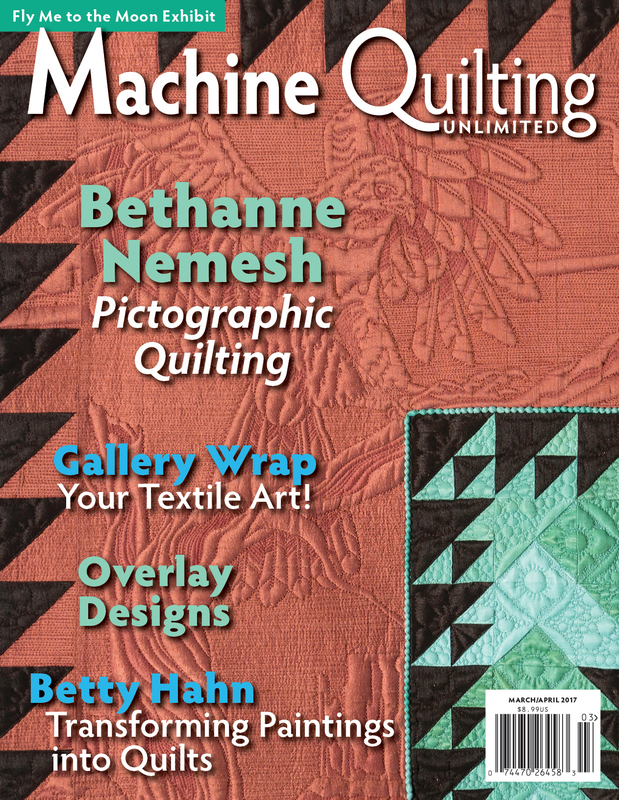 A rotary cutter and a long quilter’s ruler are invaluable for this, although an X-Acto knife and a T-square could also be pressed into service. I can’t imagine making those kinds of long, straight cuts accurately with scissors, not when they’re going to get juxtaposed with the straight edges of the furniture. Any little wobble in the cut will show up. However, perhaps others are better with scissors than I am. Step 5: Adhere fabric to tabletop. Alignment marks are your friends. In particular, the pencil line I drew when marking the border of the table was invaluable for lining up the fabric. Work in sections. 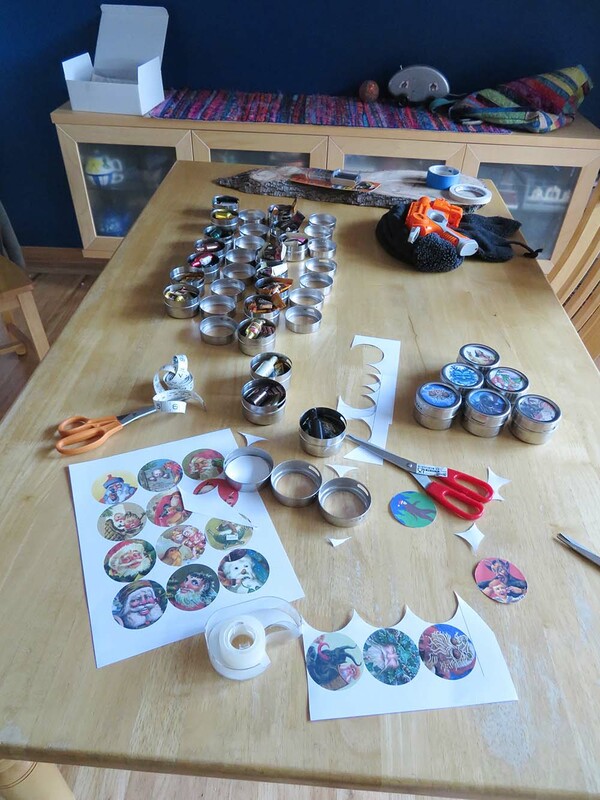 Apply Mod Podge to one section of the table at a time. Smearing Mod Podge along the width of the table and maybe 1/3 of the way down the length worked well for me. Get the fabric aligned and stuck down in just that section, then apply Mod Podge to another section. Be sure that all sections of the table that are beneath the fabric receive Mod Podge so that the entire piece of fabric will adhere. 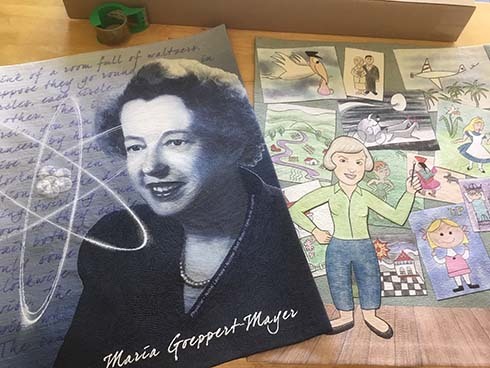 Use a brayer to press the fabric down evenly without distorting it. If you can’t lay your hands on a brayer, try a rolling pin. There may be air bubbles. Small ones can be removed by piercing the fabric with a pin, then rolling the heck out of it. Here’s a brayer. 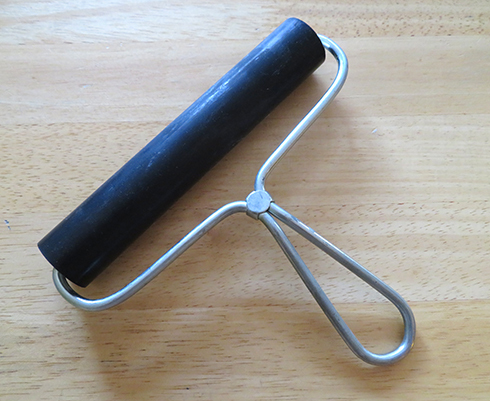 It has a handle attached to a hard rubber roller. I bought mine for a graphic design class about a thousand years ago. Sometimes art or craft stores carry them. Again, if you can’t find one or don’t want to spend the money, a rolling pin should work. This is one of the table tops after the green border was painted around the edge and the fabric was Mod Podged down. You can see that the edge of the green painted border shows through beneath the fabric a bit. It’s just a small edge, maybe 1/8” wide, and it isn’t really noticeable when using the tables. However, it demonstrates how the color of the paint that’s behind the fabric affects how bright the fabric is. Clear coat is important both as a protective finish for the paint and because the Mod Podge is not waterproof. The legs, drawer front, and aprons received coat after coat after coat of Minwax Polycrylic, per recommendations in this article. I smoothed the surfaces gently with an ultra fine finishing pad after each coat had dried, until I achieved a perfectly smooth, glossy finish. Unfortunately, that approach didn’t work so well on the tabletops. 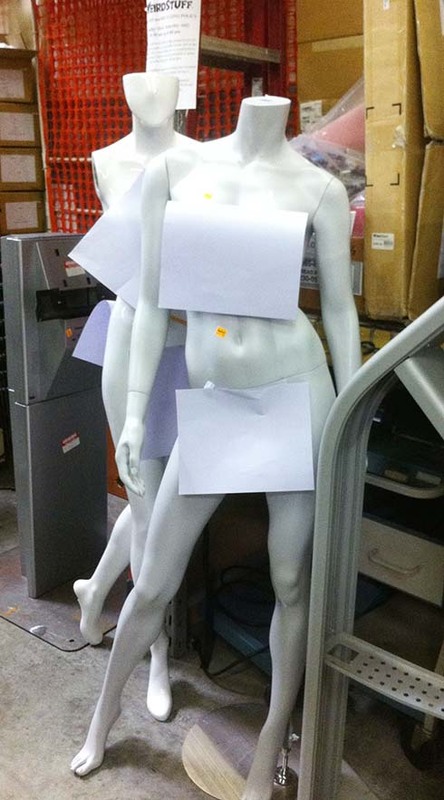 I was working on them outside a spray booth. After each coat, I found something embedded in the finish: hairs, hapless insects, an entire Triumph Bonneville motorcycle. It seemed that the tabletops were doing their best to break my heart. One night, after yet another gentle sanding to remove foreign objects, I got mad, grabbed a can of Rust-Oleum Satin Clear Enamel, and began spraying. The surface felt rough and disgusting after it dried. 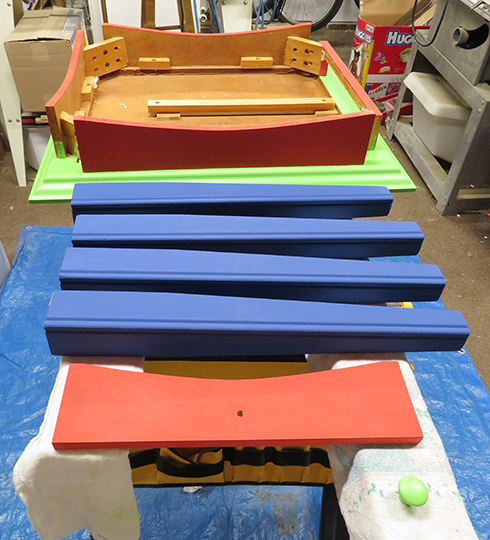 It was also even and fairly attractive, so I sprayed on a couple more coats. Step 7: Screw furniture back together. 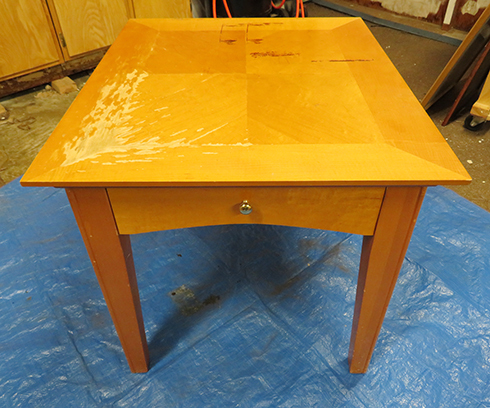 Here a finished table, sans drawer, and an unmodified table are juxtaposed. 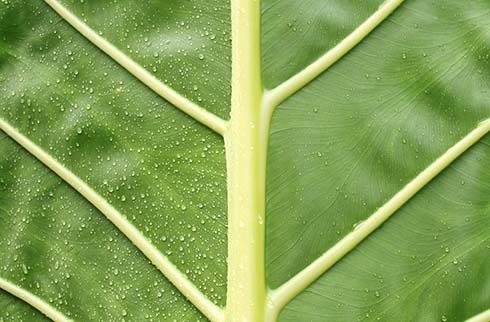 Perhaps the picture symbolizes the journey from beginning to end. A finished table with drawer installed and optional hound dog accent. 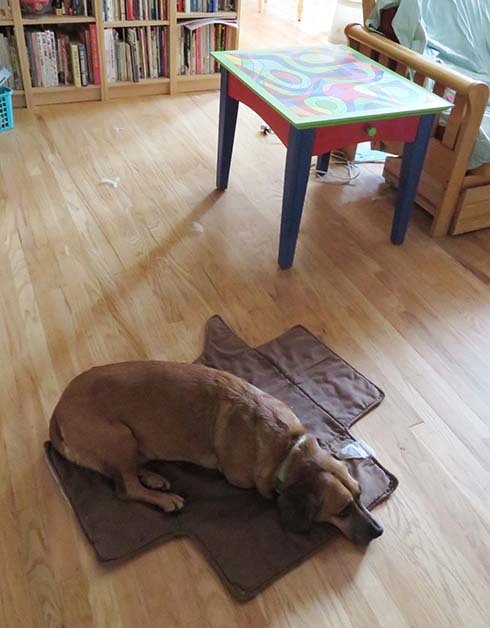 I’ve found that most furniture looks better with the addition of a dog or two. I was initially skeptical about this project, but I’ve been pleasantly surprised at how well the tables have worked out. 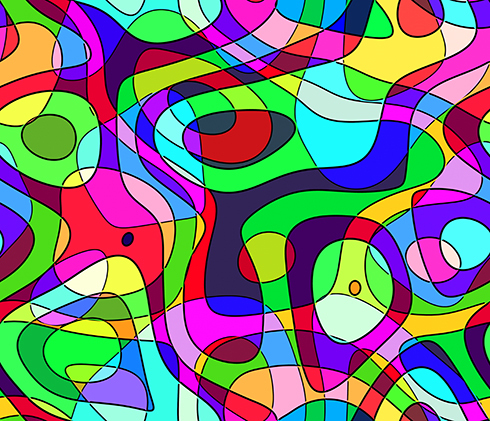 They function as pieces of pop art. As a bonus, we like seeing the tables so much that we now keep the surfaces bare. Given how horrible they were to begin with, though, we could have done almost anything to them and they would have looked better! 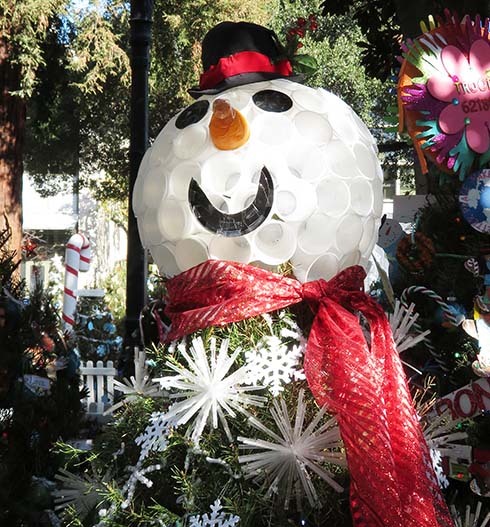 As I’ve noted in previous years, I love San Jose’s Christmas in the Park tradition. 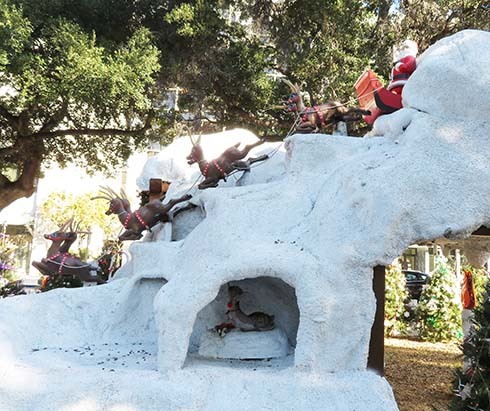 Each year, a park downtown is filled with horrible animatronic displays and trees decorated by organizations such as businesses, schools, and Scouts. 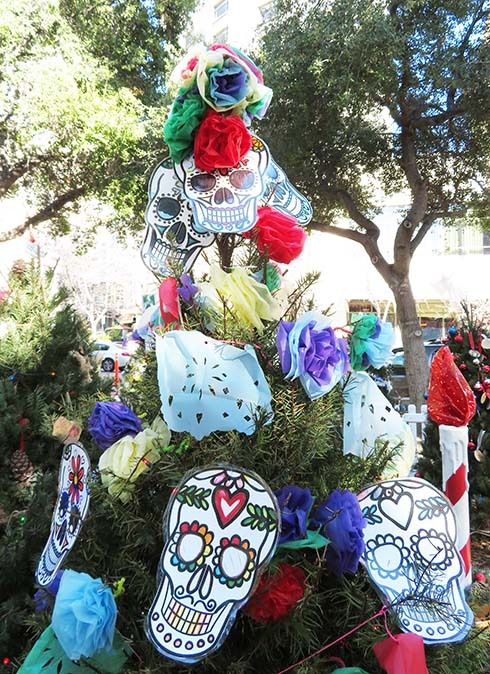 The ornaments usually lean toward being weatherproof and on the cheap side, so they won’t be worth stealing, which often adds a note of tacky fun. Sometimes they’re frankly awful, which is even better from my point of view. Recycled materials often have a starring roll. Here, in no particular order, are some of my favorites from this year’s display. 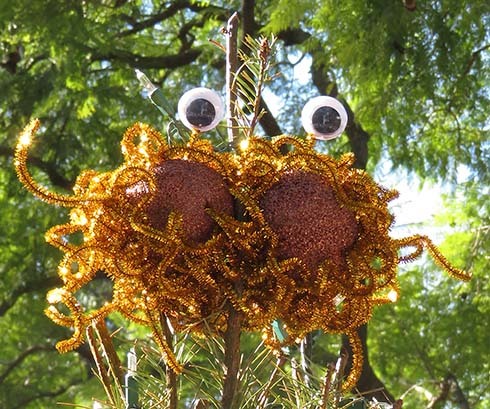 Flying Spaghetti Monster. 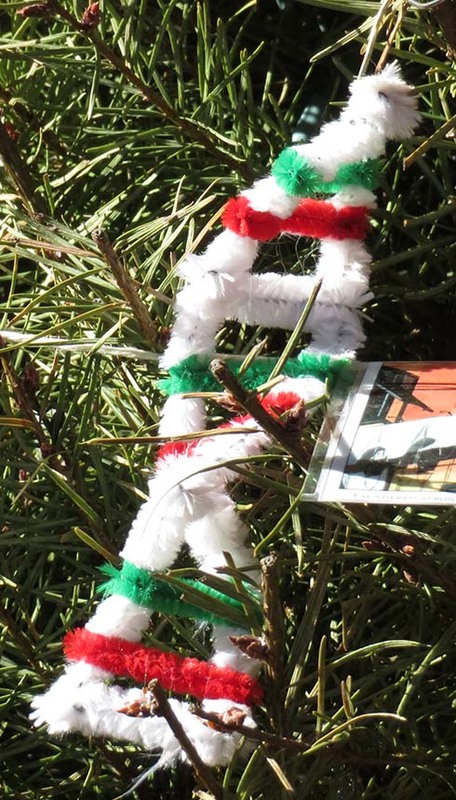 Somebody did a great job of whipping up this tree topper out of balls and pipe cleaners. A strand of DNA. More clever use of pipe cleaners. 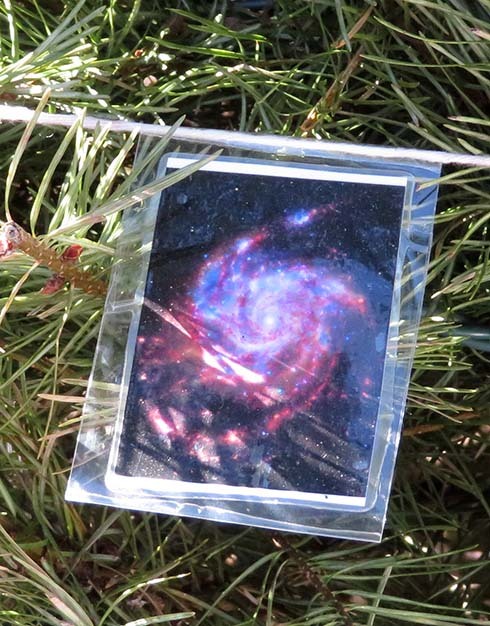 A galaxy, one of many wonders to be appreciated on the garland of the tree decorated by the Atheist Community of San Jose. The atheist tree is always a delight. 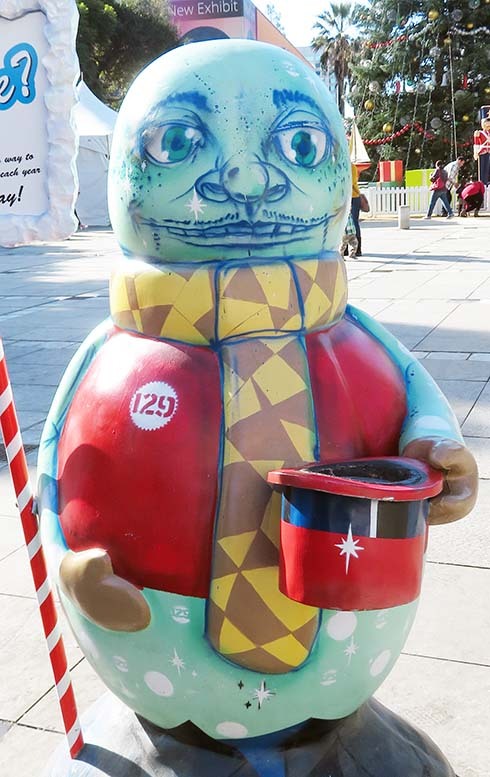 Creature with soulless eyes, holding batteries. Now I’m definitely in the holiday spirit. 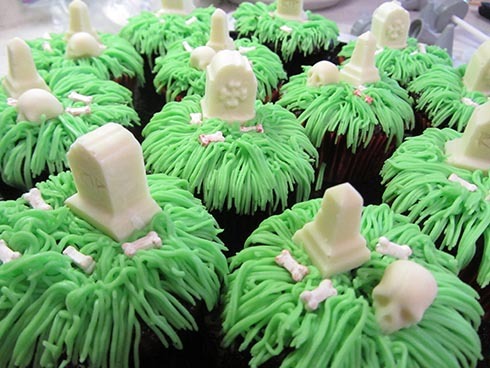 Fun and clever candy-themed decorations. This was an anti-smoking tree. I’m not a smoker and I feel for those who are hooked, wish to quit, and have trouble doing so. That said, sometimes I also have the emotional age of a nine year old boy. 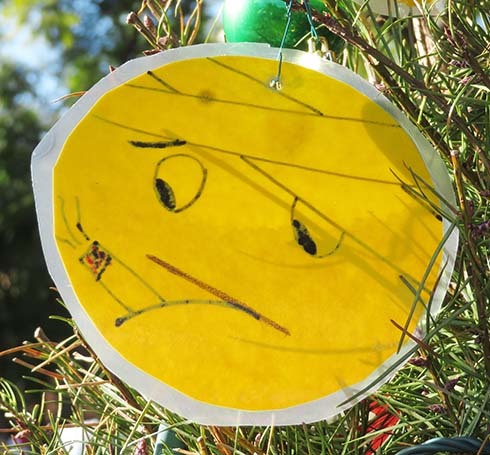 I find the idea of a Christmas ornament with somebody puffing away on a cigarette hilarious. Danny Dwagon!!! 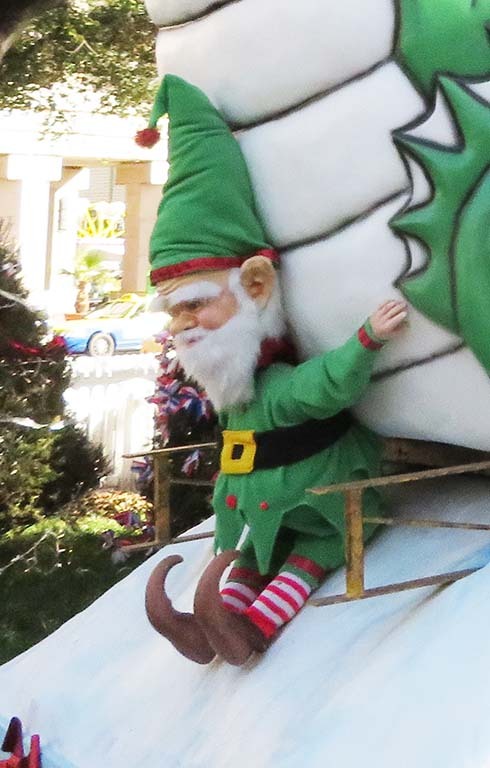 He’s here fwom Happy Howwow to hewp Santa Cwaus dewiver pweasants!!! Uh oh … so elves come out the back ends of dragons? I had no idea. I think I was happier when I didn’t know. Clever use of plastic cups. 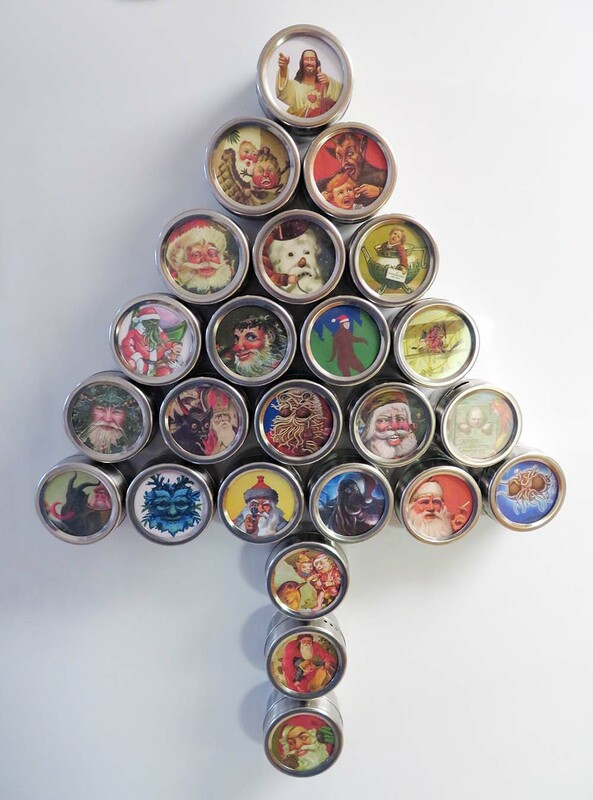 Fill ’em with beer, chug the beer down, make a snowman. Perfect, except for the fact that I loathe beer. 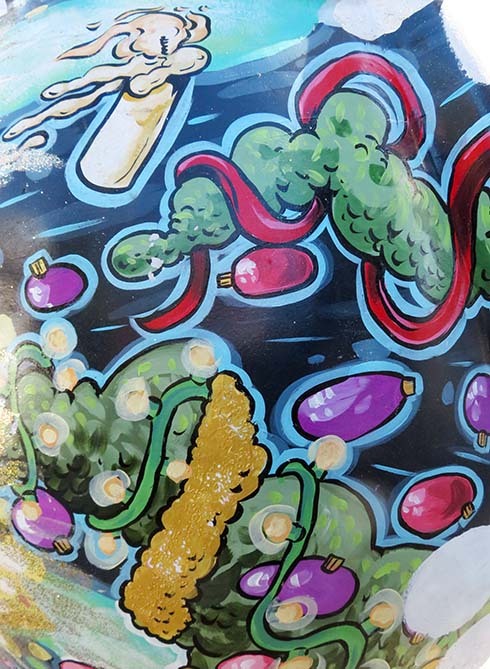 From a tree decorated with gourds. Somebody did a great job painting this one. 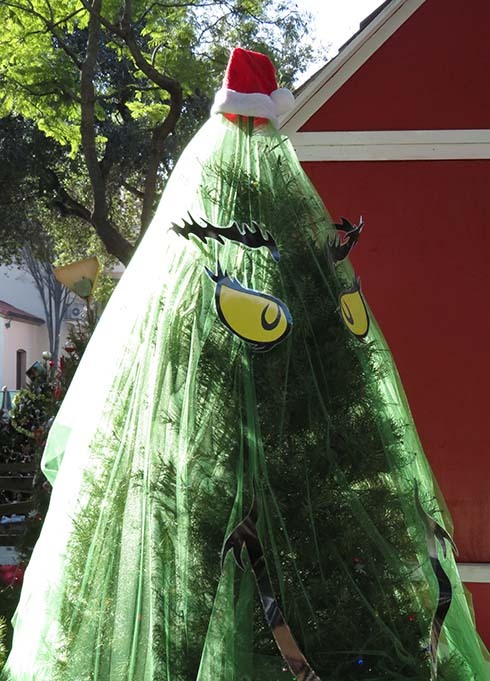 Grinch tree. 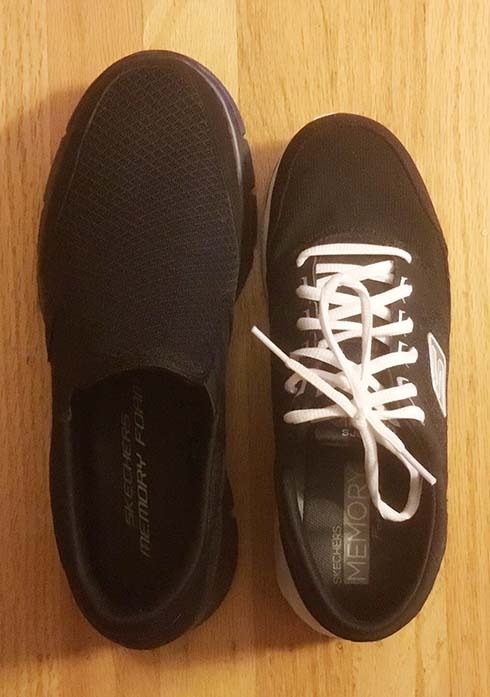 Clever and minimalist. 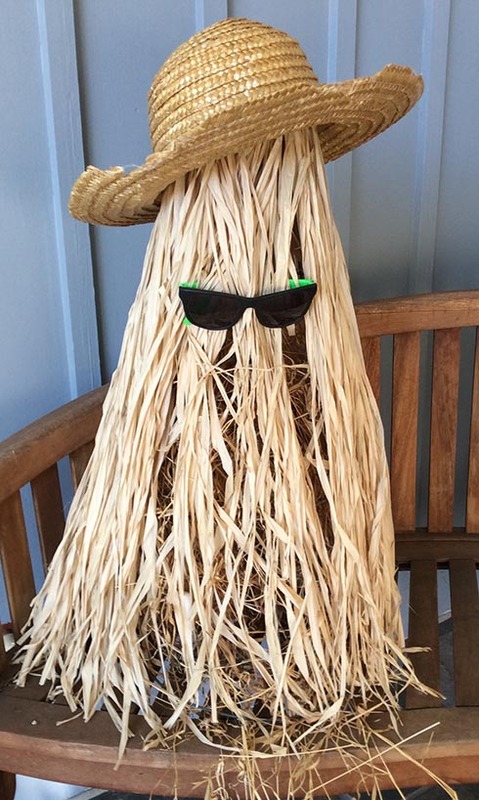 Throw green netting over the whole thing, stick on some facial features, and you’re done. 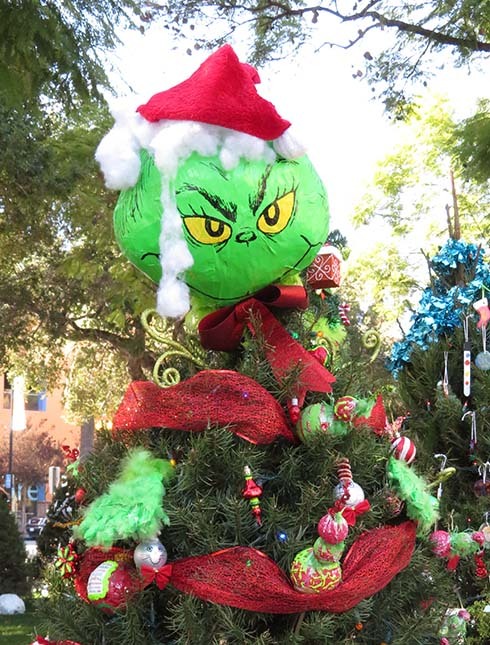 Another Grinch tree. Photo provided so that loyal readers can compare and contrast the two. 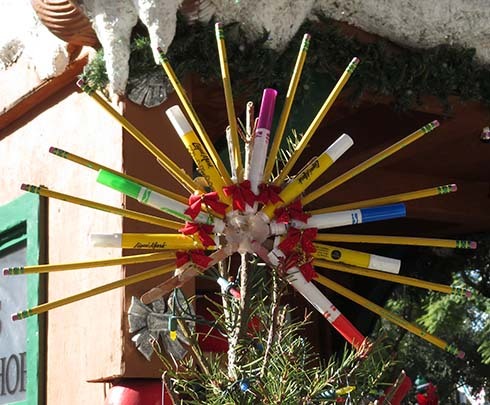 Neat idea for a tree topper. Jack Skellington. 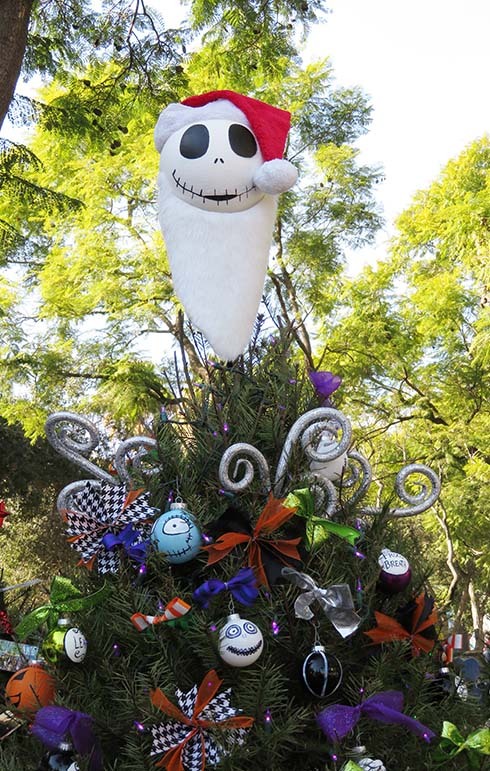 It’s hard to beat a tree with Tim Burton-inspired decorations. Oh, how fun! 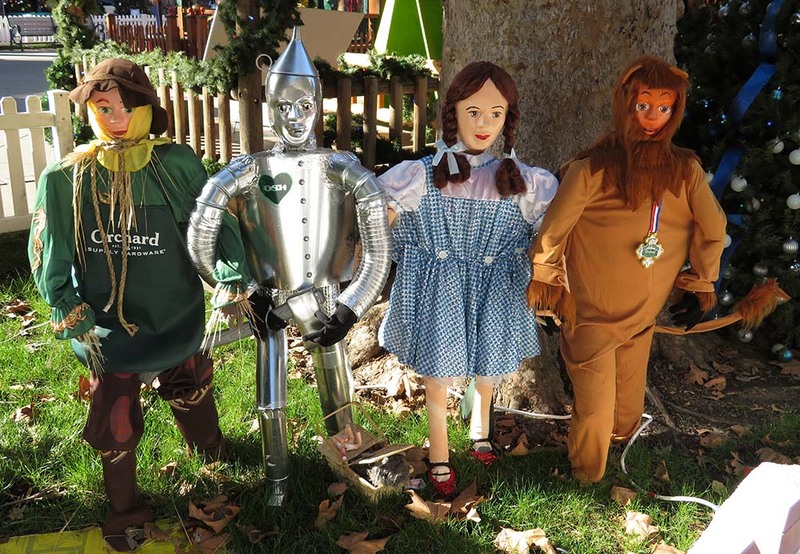 It’s the cast of the Wizard of Oz! Wait. 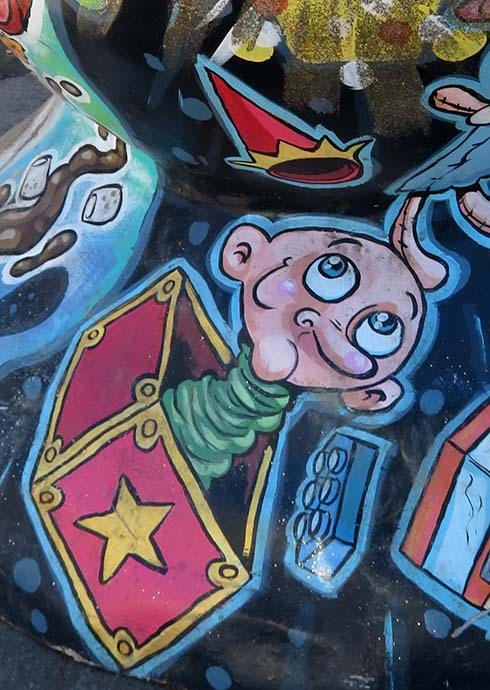 What is that … thing … on the back of Toto’s basket? 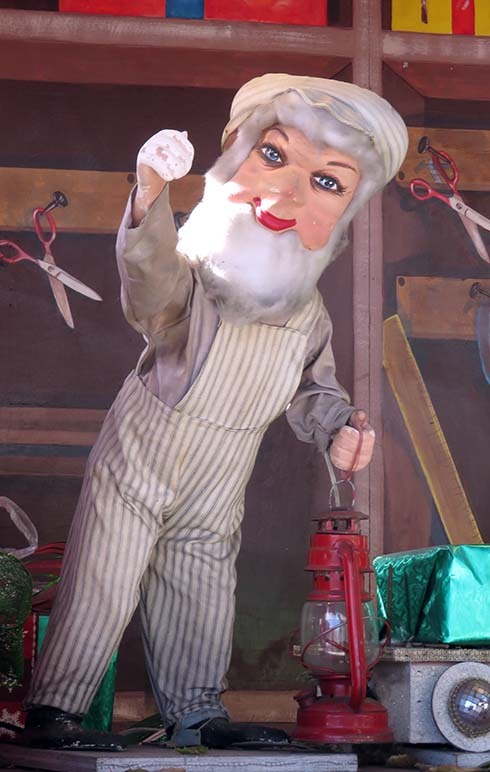 Did the Tin Woodsman lop off Dorothy’s hand? 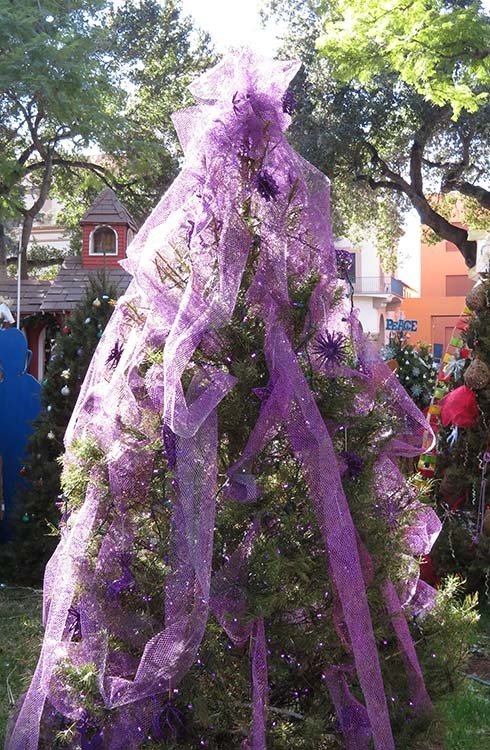 Tree topper made out of whatever the hell you have on hand. I approve. 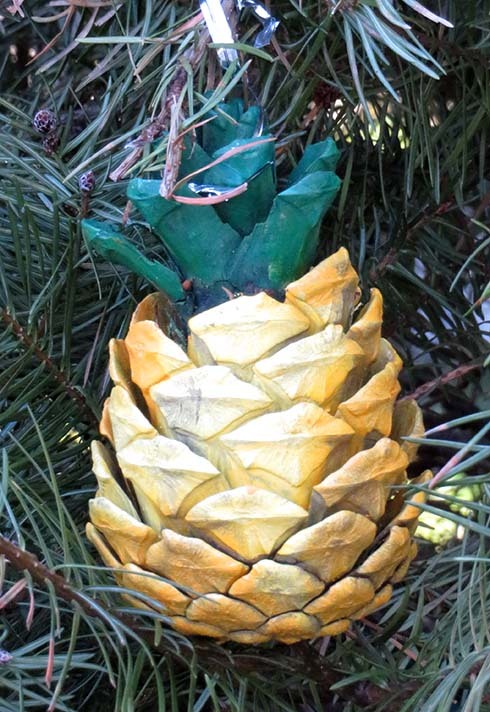 Pineapple made from pine cone. Very clever. More minimalism. Toss purple netting over the top and call it done. Yeah. We’ve all been there, haven’t we? 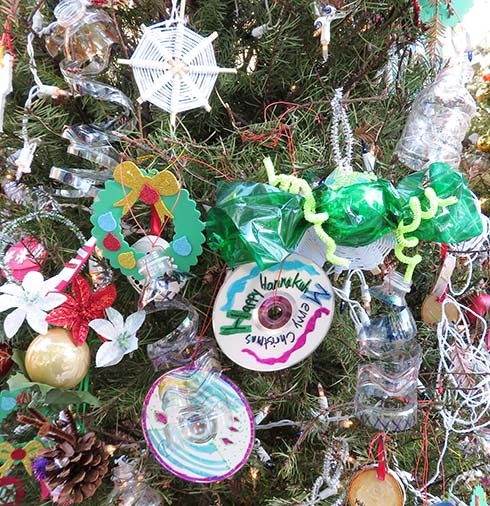 Nice sampling of ornaments made from recycled goods. 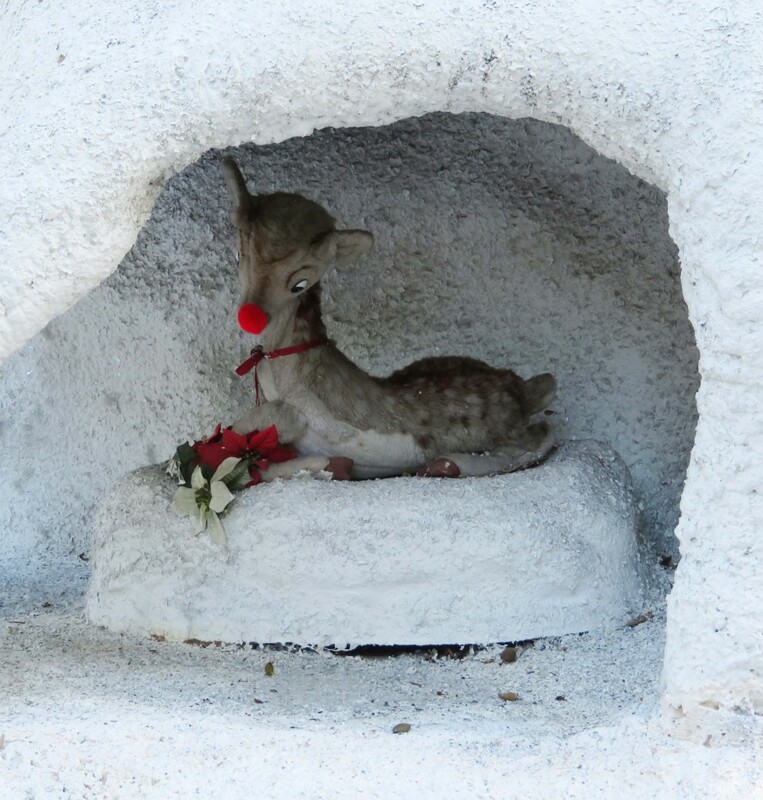 Santa and his reindeer, with Rudolph hiding out in a none-too-pleasant snow grotto. 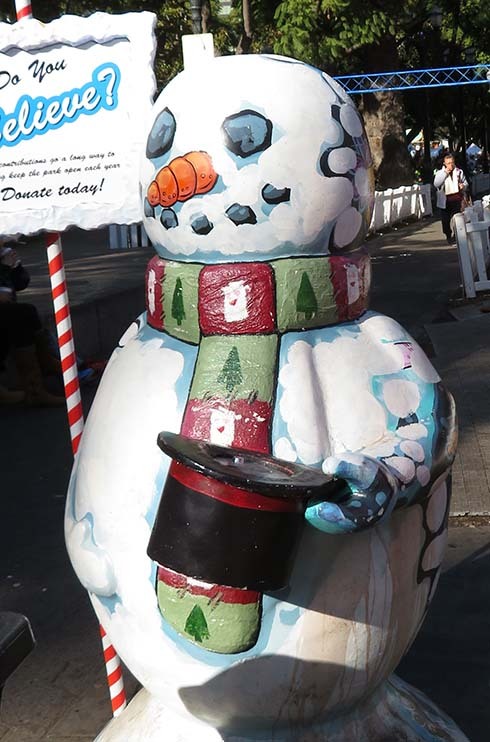 DARE to keep snowmen off drugs. Fun. This is the mullet equivalent of a snowman, with business up front and wildness in the back. 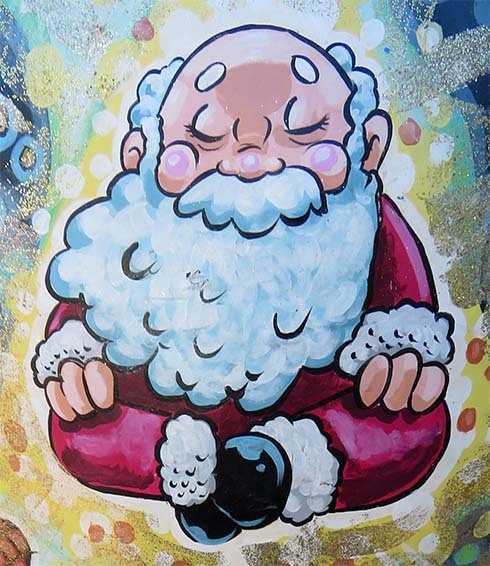 Check out meditating Santa, who’s on the back. 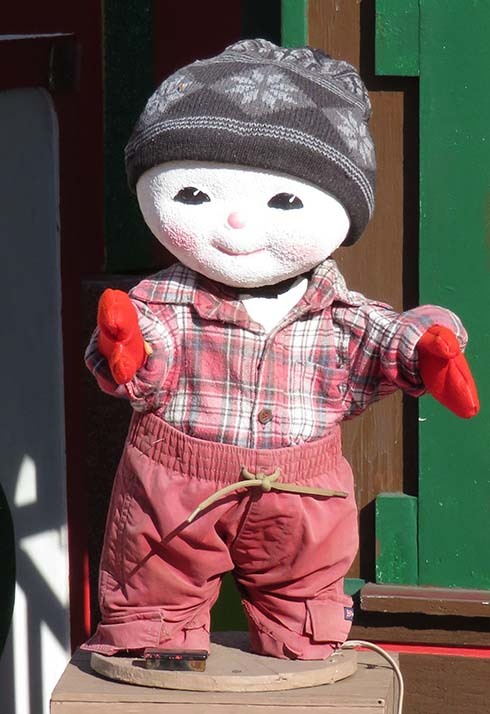 There’s also this dude, who I nicknamed “Nightmare in the Box”. Christmas tree? Taco Bell intestinal mishap? The possibilities are limitless. 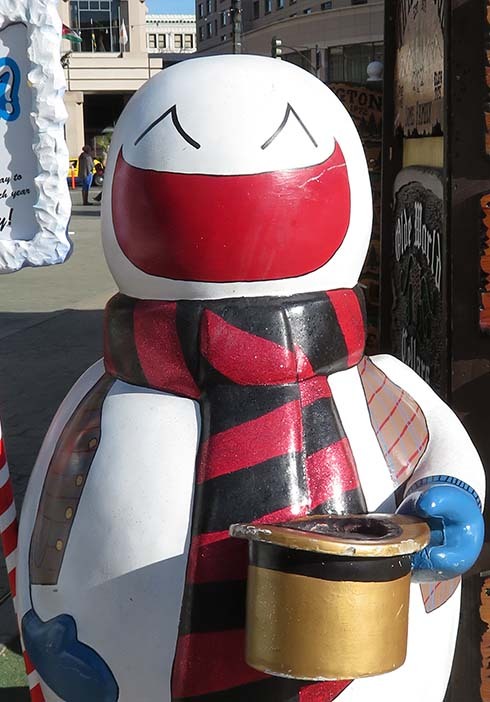 Another snowman, this time very Japanese. I think this creature rates its own horror movie, don’t you? It’s time for that ritual I think of as “repaying the internet”. To whit, if I get information off the internet and then find a twist, I need to give some information back. 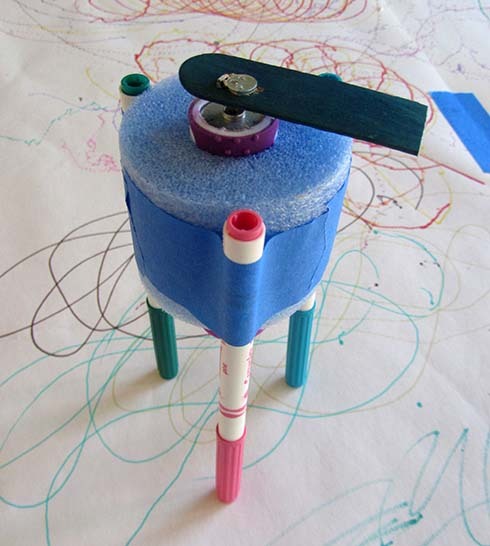 This time the topic is scribble bots, or more precisely, powering scribble bots with dollar store toothbrushes. 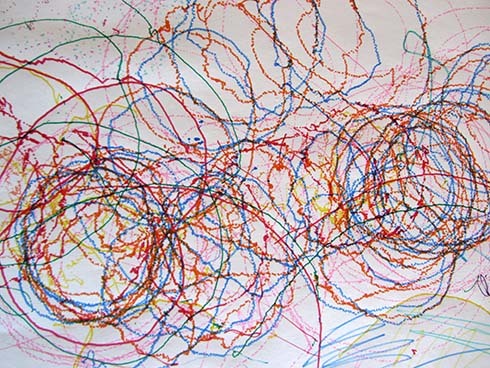 A scribble bot uses batteries and a motor to make markers vibrate across paper, thus leaving marks. They’re all the rage at science museums and STEM nights, letting one guilelessly sneak a few Physics lessons in on the kids. 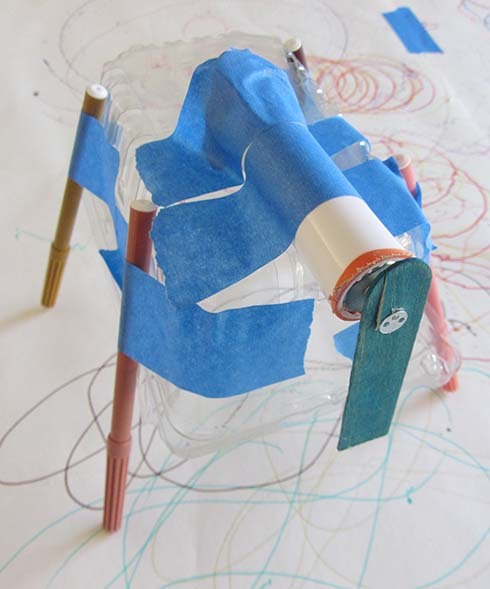 There’s all kind of information about making scribble bots on the web, such as on Instructables and the Exploratorium website. Most of them have a materials list that includes a 1.5-3 volt hobby motor. The instructions often suggest getting the motor from Radio Shack or cannibalizing one from a toy such as a dancing chicken. Radio Shack is now out of business and I don’t happen to have any dancing chickens, so to my mind, finding a motor is the hardest part of the project. Unless you have an electronics supply store around, by the time you’ve ordered a motor and maybe a switch and battery housing to go with it, things can get pricy. I wondered if there was a cheaper way to get the necessary parts. Might there be something at the local dollar store? Indeed, there was. Our local dollar store had an array of the world’s saddest-looking electric toothbrushes. Instead of rotating a group of bristles like one’s Braun or Oral-B, these battery-powered devices jostled a stationary brush head a tiny amount, pretending to give a jolt of dental cleaning power that couldn’t be obtained by simply moving one’s hand. Disassembling a brush revealed that it had a motor with an offset weight. This was exactly what was needed for a scribblebot. Perfect! 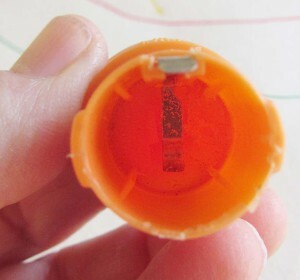 Here’s a typical dollar store electric toothbrush with its guts squeezed out. Here we’ve cut the handle away from the rest of the toothbrush. The handle can then be used to hold the motor, battery housing, and switch. Here are the parts we’re sticking back inside the handle. Notice that we’ve cut the handle just short enough to reveal the offset weight, so that it can have attachments and twirl around freely. Also note the electrical connections circled in red. 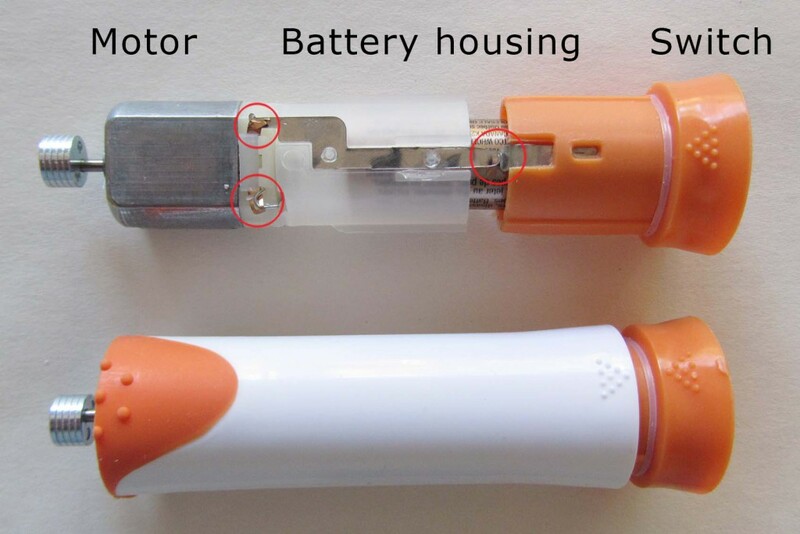 These are necessary for forming a complete circuit between the battery and the motor. 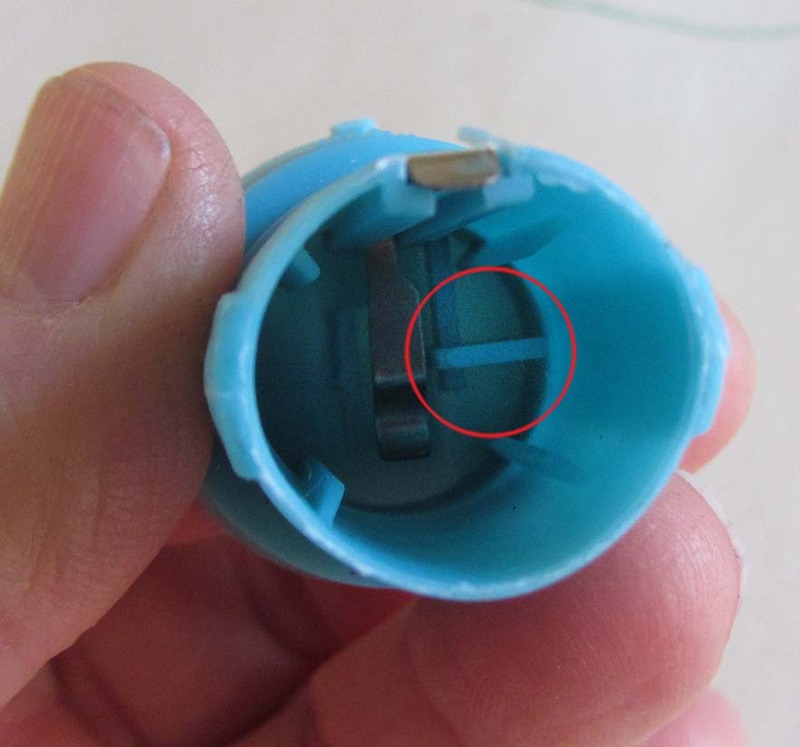 The connections at the motor end aren’t going to be accessible once the parts are put back in the toothbrush handle, and they may be flimsily assembled. Make sure they’re making contact when you reinstall the parts. Here’s one other fun tidbit. 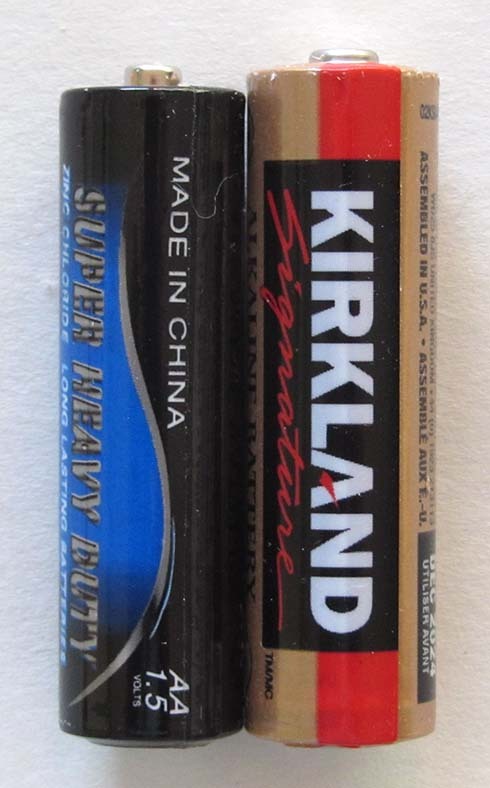 I noticed that the supposedly AA battery which came with the toothbrush wasn’t the same size as a standard AA. It was shorter and narrower. I could force a fresh, standard AA battery into the brush handle, but the motor would no longer work. The circuit wasn’t making up. Sometimes there isn’t enough profanity in the world! No doubt this is by design. Probably the owners of People’s Electric Toothbrush Factory Number Five don’t want shoppers to use their cheap dollar store toothbrushes indefinitely, so they’ve intentionally made it difficult to replace the batteries. We aren’t using the toothbrushes for hygiene purposes, though, so we do want to be able to replace the batteries. If you run into this issue, remove the end of the battery holder and peer inside. I found that there was a vertical plastic standoff inside, precisely calibrated to the dimensions of the supplied battery. After removing the standoff with a Dremel tool, a standard AA battery fit and my circuit made up. Lousy photo of a battery holder after removing standoff. Pretend that you can see where I’ve made the modification. Also, pretend that I have a decent manicure. Alright. We’ve sawn and fiddled around and modified a cheap toothbrush. What next? How about making some additional weights? These weights, which are made from wide tongue depressors, can help make the motion of the scribble bot more erratic. Here we’ve installed a weight on the protruding end of a motor. Note that we have the weight aligned with the mass of the off-axis weight already on the motor. 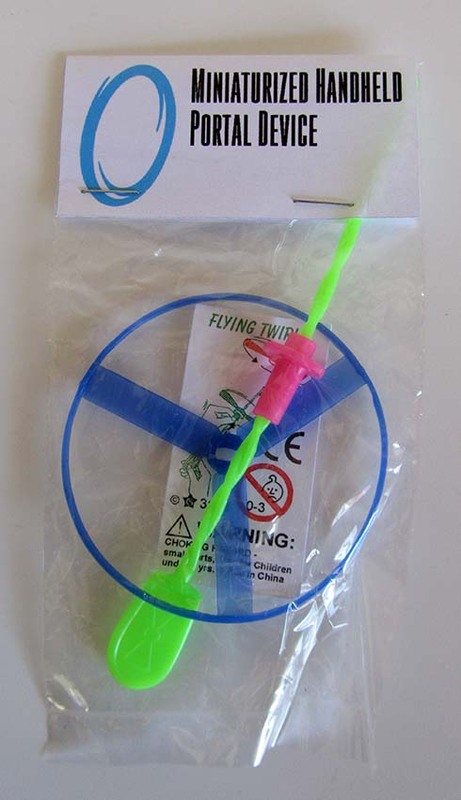 A portion of a pool noodle with motor mechanism tucked inside and auxiliary weight on top. Another pool noodle design, this time with the motor at the bottom. It’s interesting to see how positioning of the center of mass affects the motion. A highly elegant Greek yogurt cup model with outboard motor. Strawberry basket, outboard motor. Classic. 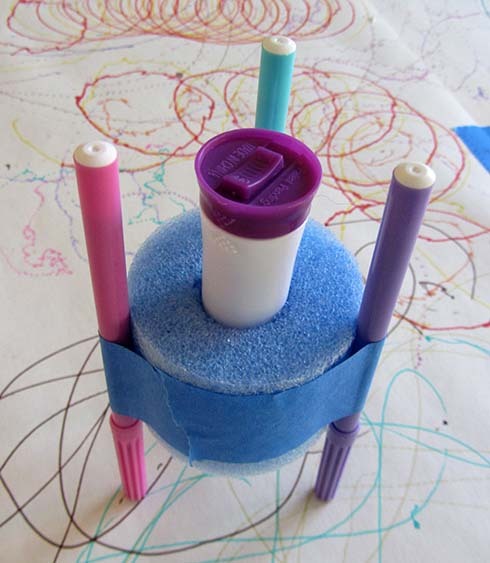 Add some razor blades or a scalpel blade to the tongue depressor weight and you’ll have a fighting scribblebot, as well as occasion to visit the emergency room. 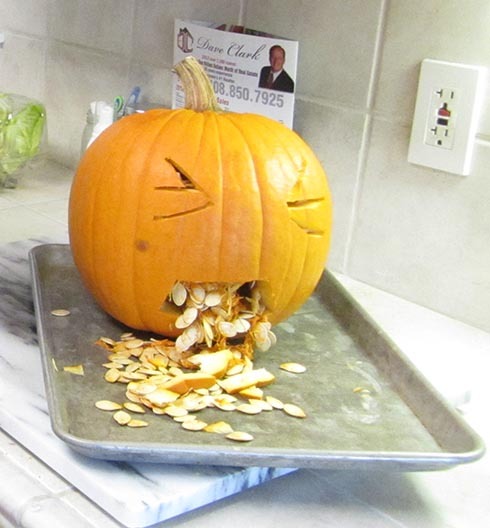 In a few weeks I’ll try all of this out with children – well, except for the part with sharp blades. We’ll see how it goes. I anticipate that there will be chaos. 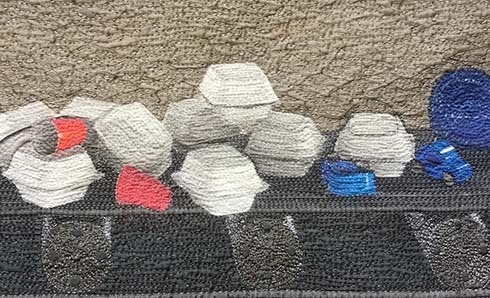 The big quilt show in Houston, IQF, is over. I learned that my piece, Why Knot? received third place in the digital category. It’s true that IQF isn’t an art show per se. 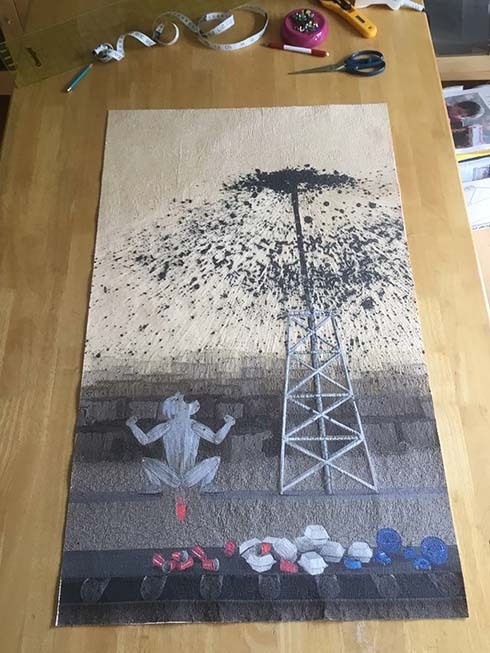 Although it does show some genuine artwork that happens to be made of fiber and is quilted, the show isn’t on the radar of the larger Art World, as far as I know. If it was, the “Husbands’ Lounge” (I assume that was still there this year?) or events like the costume contest or tiara parade would knock it clean away. 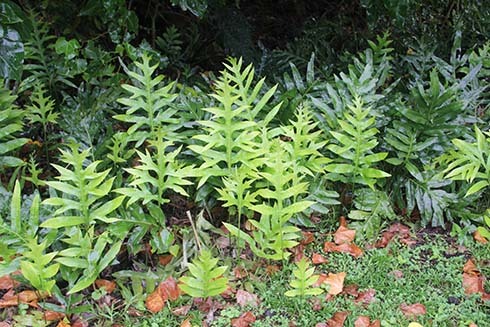 It is, however, enormously popular and many people love to go there, or dream of doing so. 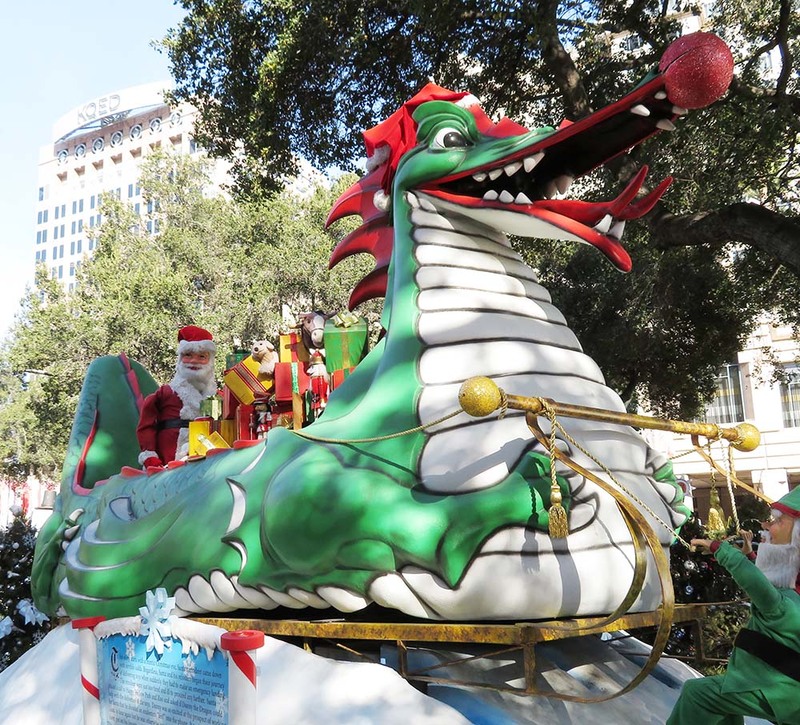 It provides an enjoyable escape where people can browse, admire others’ workmanship or artistry, do a spot of shopping, and bask in the font of natural beauty that is downtown Houston. 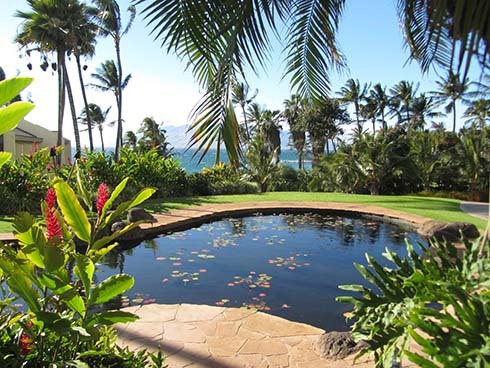 Many people make a week or weekend of it, staying in hotels, eating out, and socializing. This is Serious Art. Give me money now. Here is what I’ve learned: with few exceptions, nobody cares. Nobody is watching. There are many, many people creating artwork, and most of them are busy doing their own thing. We have to take care of ourselves. If we’re lucky, we get to connect with a few other people and we get to appreciate others’ work. Do whatever it is you like. In a hundred years, it won’t matter one way or another. Exhibiting in Houston or not exhibiting in Houston probably isn’t going to affect one’s art career. If one is born female and one’s medium is fiber, chances are there isn’t going to be worldwide recognition from the Real Art World anyhow. One of the things I like is having my work seen. 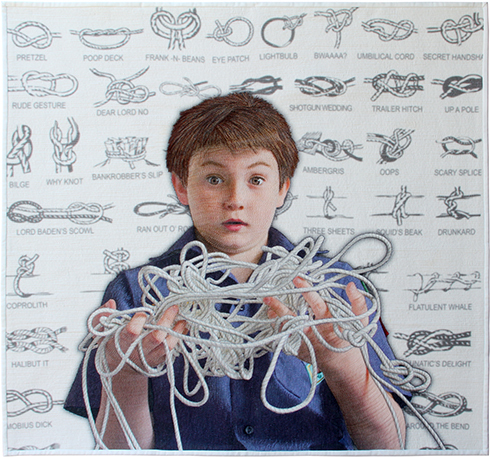 One of my series is comprised of portraits of my son in various situations, both real and imaginary. It isn’t on par with Wyeth’s Helga series, but the boy and I enjoy collaborating and we both get a kick out of seeing his portraits published or exhibited. That’s the majority of my work now, while he’s young and enjoys it. 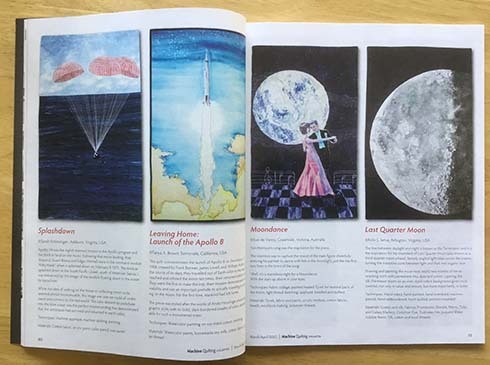 If my work is shown at Houston, I can figure on 50,000-60,000 people attending. Of those, I can estimate maybe 25,000 will walk down the aisle with my work and maybe half of those will take a good look, and hopefully enjoy it or get a giggle. That’s 10,000-15,000 people I got to share some joy or a joke with. That’s probably far more than saw my work when it toured with Quilt National, much as I treasured that experience. Alas, I wasn’t able to go to Houston this year. Actually, I could have gone but didn’t. My husband would have bent over backwards to watch our kid for a few days. Unfortunately, barring one of those statistically unlikely “Drop everything; you’ve won a top prize!” situations, going just isn’t practical when one has a kid. These will no doubt get me barred from providing class cookies in the future. 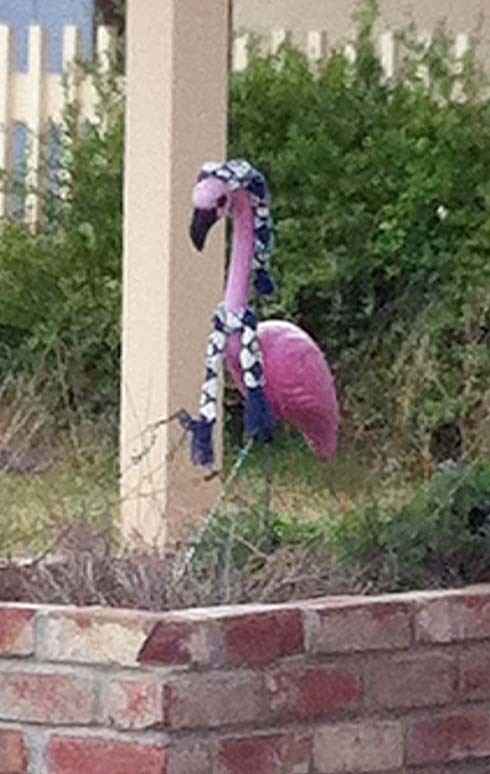 IQF Houston often occurs around Halloween, you see. I’m going to go out on a limb and state that their target market is largely comprised of people with empty nests – women, middle-aged to elderly. They’re mostly white, mostly conservative. Not entirely, mind you; I always see a few men and some younger people when I’m at a show, and I don’t mean to imply that quilt shows are trying to exclude non-whites. The demographics may also skew depending on the region of the country. But mostly, when I go to a quilt show, that’s who I see: middle-aged to elderly women who probably don’t have kids at home. People who don’t need to worry about staying home for Halloween. 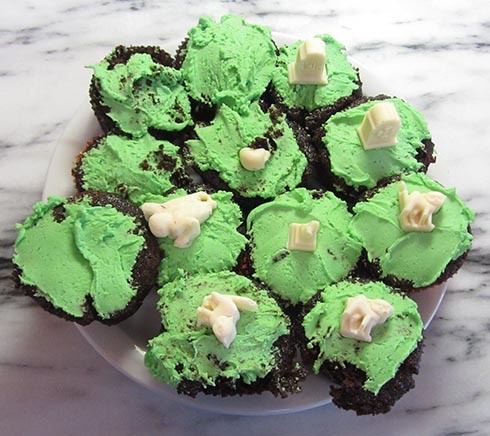 These cupcakes went to a party. The Festival is wildly popular and, I assume, wildly profitable. 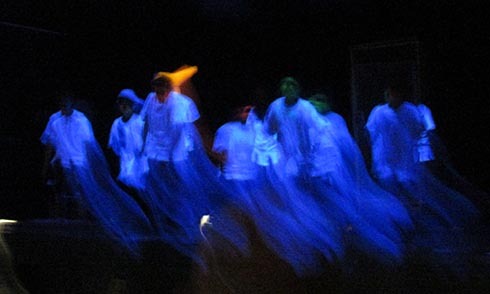 The people who run it have quite a bit of practice and know what works for them and most of their attendees. It doesn’t work for me, though, and probably won’t for the foreseeable future. For example, going to the Winners’ Circle celebration on a Tuesday involves a day of flying, hurrying to the convention center, then having the next day wasted because exhibits don’t open until Thursday. The last time I tried it, my intestines were coiling up and threatening to spring out of my body during the award ceremony. It would have been nice to have seen the show this year, but on balance I’m glad I didn’t go. 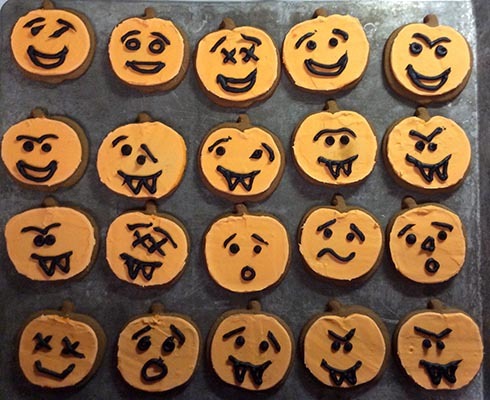 I would have missed my son’s Halloween party, school party and costume parade, zombie dance number with his Cub Scout troop, and of course, Halloween. Kids grow up. There are a limited number of years when one can bake cookies for parties or make Wii controller costumes. My kid is the one with the cone on his head. Of course. The Festival will simply have to wait a few years. Making goody bags for Halloween, part of my master plan for clearing excess junk and craft supplies out of the house. I’m recovering from a shoulder injury, so I can’t yet do the things I want to do: paint, 3D work, stitch. However, I can put a shirt on without groaning and I can sort of type, so here we are. 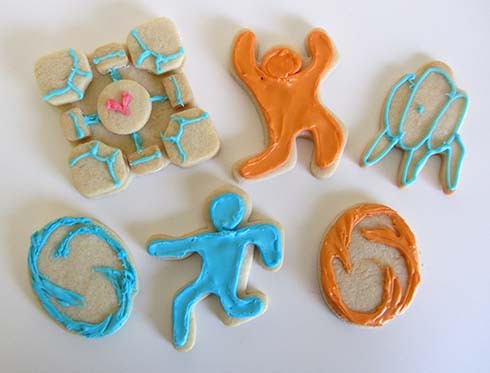 Let’s talk about the Portal party. The boy just had a birthday, which meant that there needed to be a party. That’s one of the things you don’t think of when you’re longing for a little bundle of joy, that if you’re from a culture which celebrates birthdays, you’re going to be in the party business. It doesn’t matter how awkward your social skills are, how little you know about parties, or what your socioeconomic status is. 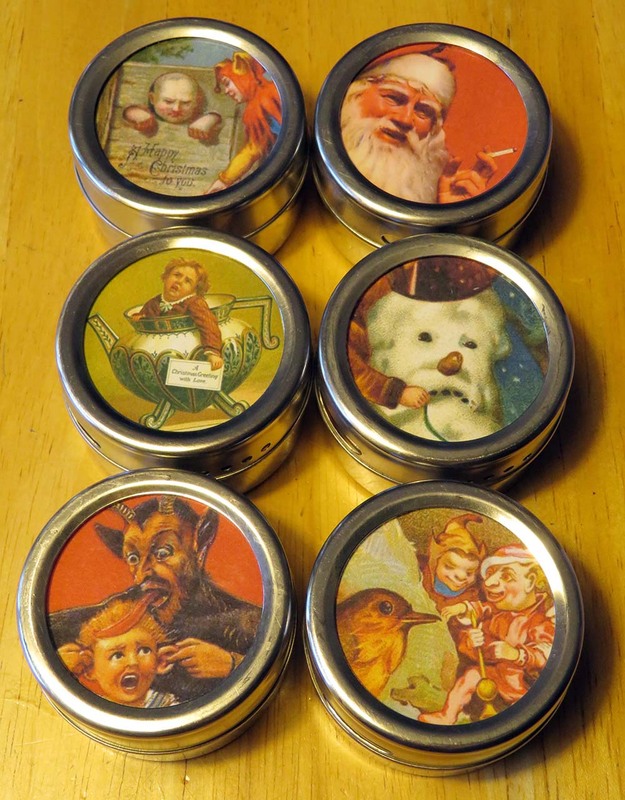 When the kid gets old enough and his birthday rolls around, you’re going to do your best to dredge up some family or friends and come up with something vaguely cakelike, even if it means stacking up a pile of Ding Dong clones from the dollar store and jamming an emergency candle in the top. Now, I don’t know anything about birthday parties. They’re a mystery to me. Maybe that’s why I’ve hosted some really bad ones. The worst was at a miniature golf facility. The “concept” consisted of hosting a few games of miniature golf, playing some arcade games, and hacking down greasy snack bar food inside the windowless, stained concrete cell grudgingly set aside for ingesting food. “No stress!” crowed my husband, “They’ll provide everything! You won’t have to worry or do any work!” Bless him. It sounded like a good idea at the time. We invited only two guests, one of whom was quite late. We waited. And waited. And waited. The other guest, who’d arrived promptly, was bored to tears. So was his family. So were we. (Actually, that’s a lie. 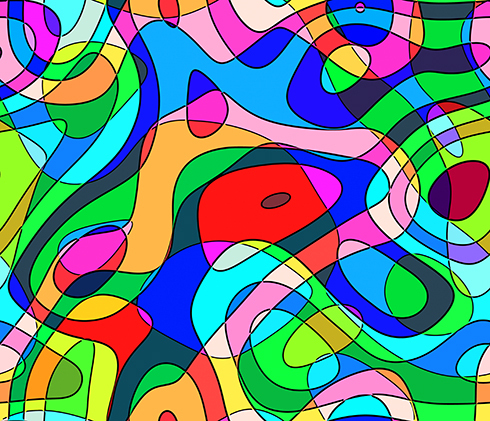 I wasn’t bored; I was anxious and stressed out.) At one point I ended up watching the guest’s younger sister for a few minutes. You know how you can sometimes tell that you give people the creeps? Yeah. I severely gave her the creeps. She really didn’t want to be around me at all, much less alone with me, yet there we were, alone in the grease-stained concrete pizza cell. I edged over to the doorway and stood half in and half out of the room so I could plausibly make sure she was safe yet respect her need for space. Ghastly. That party was beyond awful, somewhere in Dante-circle-of-hell awful. I wanted this year’s birthday party to not be awful. I also wanted to not have it at a facility. This falls under the category of “first world problems everyone should be fortunate to have”, but I’m tired of drumming up marginally interesting activities which fall flat (“Go karting! Laser tag! Indoor skydiving! Travel to low Earth orbit!”), haranguing people to RSVP, and hauling around a small mountain of food and cake and other nonsense. No, this party would be at home. We’d provide food, entertainment, and relaxed hospitality and not worry over whether people showed up or not. It would be intimate, more modest, and hopefully more fun. We just needed some ideas. I started poking around and found about the Game Truck. Boy, that sounded neat, like something a pack of boys would really enjoy. The Game Truck folks would quite literally bring a truck load of video games and consoles around to one’s house. We could herd the kids in to the truck, have them play video games until they’d lost thirty or forty IQ points, stuff some food down their gullets, then kick them out to the curb beside the forgotten garbage cans. Why not? Game Truck was well reviewed and their fees weren’t outrageous, given that a human being had to drive an entire truck out and manage a bunch of children for hours. Unfortunately, we’d be paying someone to bring out a bunch of equipment we already had. The boy loves video games more than anything else in the world, so for years he’s spent every penny he gets on games, video consoles, and more games. We even have two copies of the much-reviled E.T. from 1982, courtesy of my in-laws. 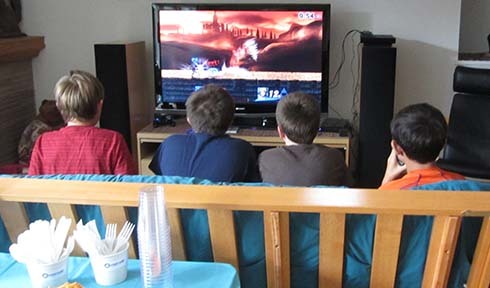 Well … how about hosting a game party in our house, then? How about bringing out ALL of the consoles and ALL the games? My husband and the boy thought this was a great idea. Yeah! Games! Food! Young men grunting at each other! Alright, then. That was settled. Now we just needed a specific video game to theme on, something other than Minecraft. Minecraft is great, but as far as parties go, it’s been done and done and done. Enough pixellated blocks of cake have been served to blanket Mongolia. It’s the same with Space Invaders, PacMan, etc. “PacMan! We’ll cut a wedge out of the pizza and call it PacMan pizza!” Dear lord, no. Didn’t we get all that out of our systems in the 1980s? It was time to go dystopian. 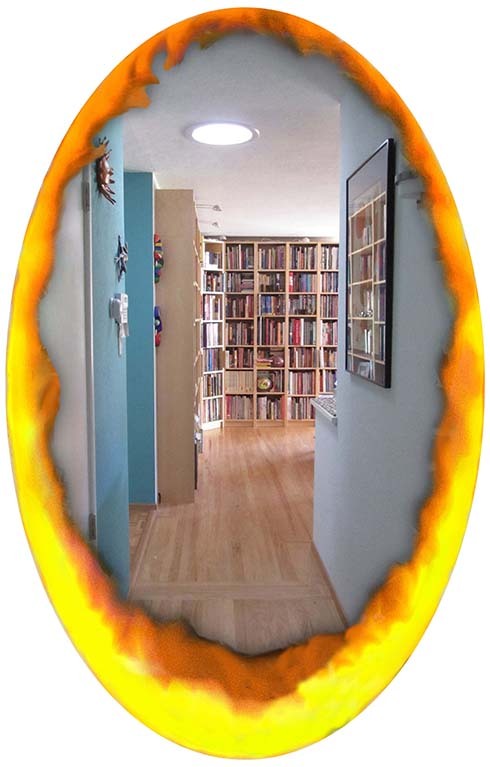 Portal. Oddworld. Bioshock. (Big Daddy bento box, anyone?) Obscure would also be good. For example, a party themed around Soviet Arcade Games could be interesting. So, Portal it was. Never mind the fact that the guests have been kept in tidy little nests of cotton wool and the Portal references went right over their heads. Kids can feel when something is thematically right. They can feel the respect. They can appreciate the Combustible Lemons and Companion Cubes. They can threaten each other with the lemons, even. I sent out invitations and got to work. It was time to make some props. 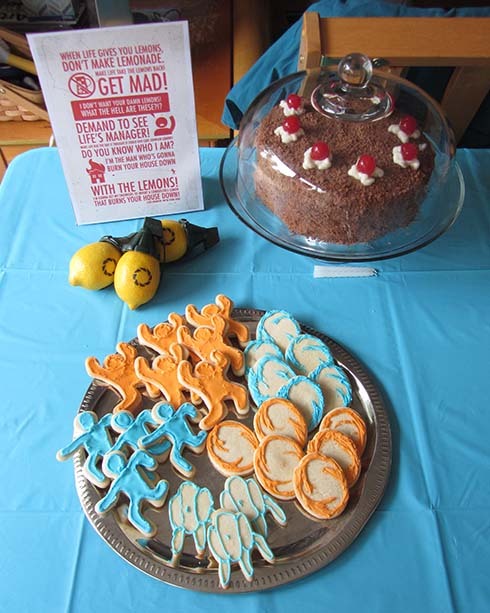 I didn’t want to throw a Portal-themed party without portals. 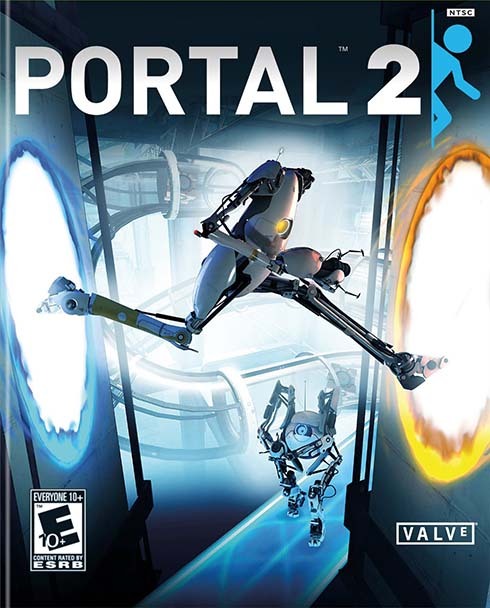 After all, the games are named Portal and Portal 2. One solves nasty little puzzles using portals. Also, portals make nice large wall/ceiling/floor embellishments, thus taking care of some of the party decor. Portals were a must. Digitally add orange and blue portal outlines. 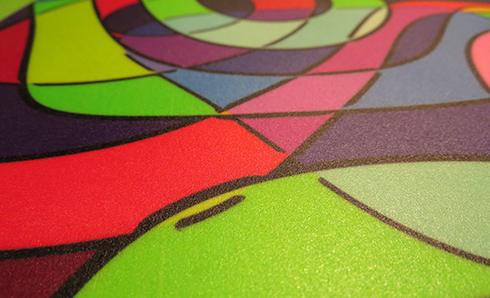 Print the resulting graphics at human size or as large as one can manage. I pieced ours together out of 8 1/2 x 11” sheets of paper because I’m cheap. Laminate the prints at an office or school supply store for extra durability, especially if they’re to be placed on the floor. Voila! Portals! Did anyone notice them and think they were cool? Nope. But they made me happy. Cake – there are a jillion recipes for Portal cake out there. Some wiseacres have even made “cake” from meatloaf and mashed potatoes, thus ensuring that “the cake is a lie” and leading to hordes of groaning guests. This one was a basic chocolate with chocolate buttercream and grated chocolate. I suggest freezing the chocolate shavings before trying to press them into the frosting. I didn’t do that initially and I ended up with melted chocolate shavings all over my hands. I couldn’t let the dogs lick the stuff off my hands, since chocolate is bad for dogs, so I had to do it myself. On second thought, maybe don’t freeze the shavings. Having to lick chocolate off your hands isn’t the worst fate in the world. 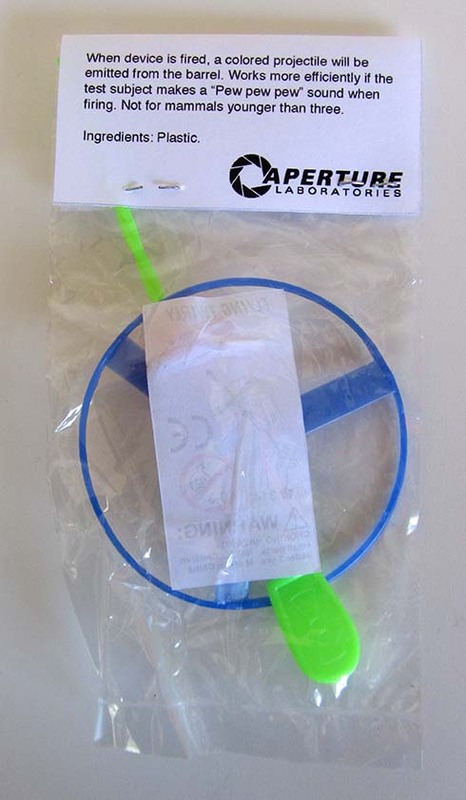 Portal cookie cutters – These used to be available from ThinkGeek, but have since been discontinued. They can still be found at the usual places around the web for often-ridiculous prices. 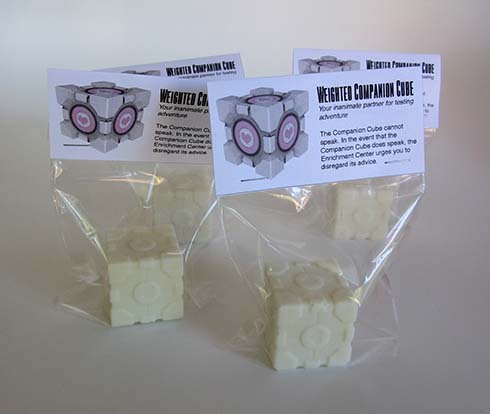 We included a few of the Companion Cube cookies in favor bags, despite my doing a crummy job decorating them. Not that it mattered – I don’t think the kids knew what Companion Cubes were, so I could have drawn a picture of Richard Nixon on them and they wouldn’t have known the difference. 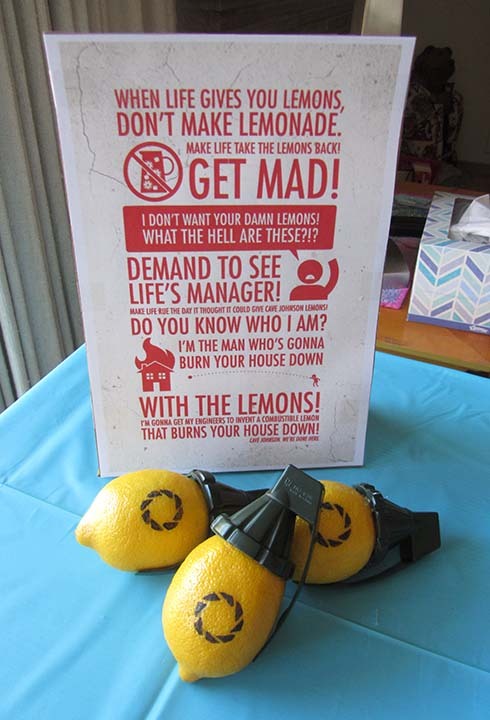 Combustible lemons – The poster with Cave Johnson’s classic rant is available from a vendor on Etsy. There are instructions for making combustible lemons out on the web, not that one really needs them: stencil a logo on a lemon and glue on the top section of a toy grenade. The most difficult task was finding inexpensive plastic toy grenades. Sure, they can be bought on Amazon and eBay, but who wants to pay ten bucks or more for some chunks of plastic which will get sawn in half then thrown in the trash? Fortunately, some cheap grenade toys turned up at a party and costume store. If I had it to do over again, I’d use stronger adhesive, maybe E6000. It was predictable that a group of young males would pick up the combustible lemons and start heaving them around, and the hot melt glue didn’t hold up well. Cave Johnson would have been disappointed in me. There’s some wonderful fan art on the web. People have spent hours recreating signage from Portal, rendering significant quotes, or coming up with their own take on the Portal theme. It’s pretty amazing. 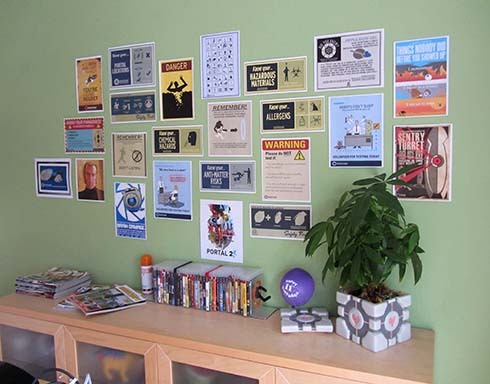 I printed a bunch out and used it on the walls as decoration. 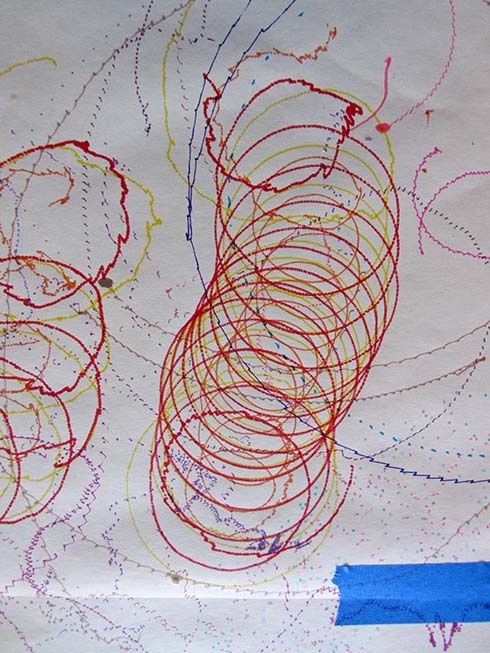 Afterward, since my son really loved people’s artwork, the prints went up on the wall of his room. 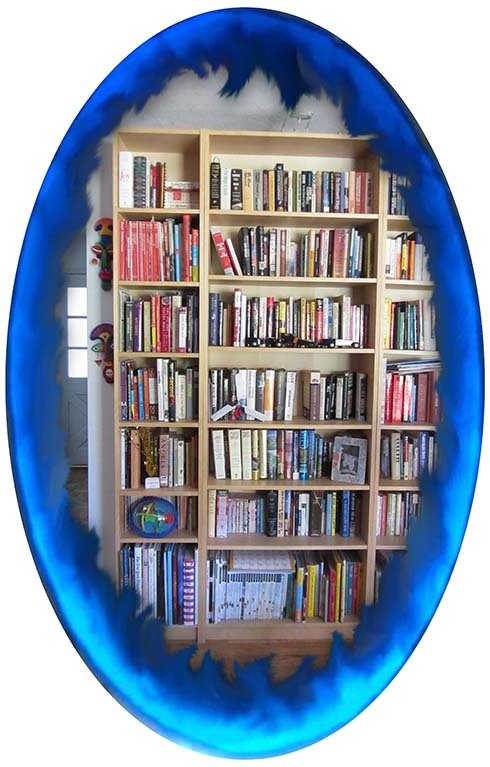 The Portal bookends, which can just barely be seen in the photo, can be found on Amazon or ThinkGeek. If you’re going to have a Portal party, you need at least one Companion Cube. This cookie jar used to be available from ThinkGeek; maybe it still is. 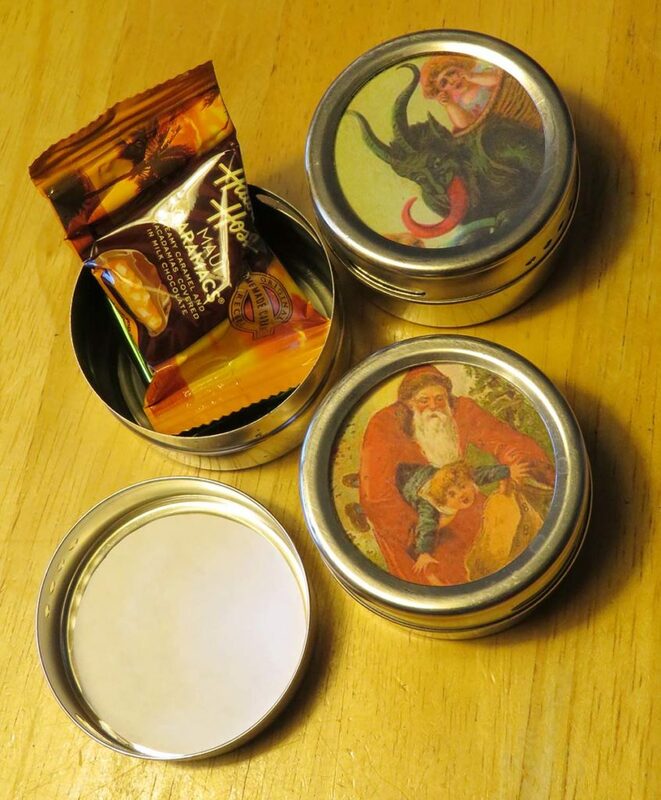 There’s no seal on the top of the thing and its lid rattles around, so it’s lousy for holding cookies. 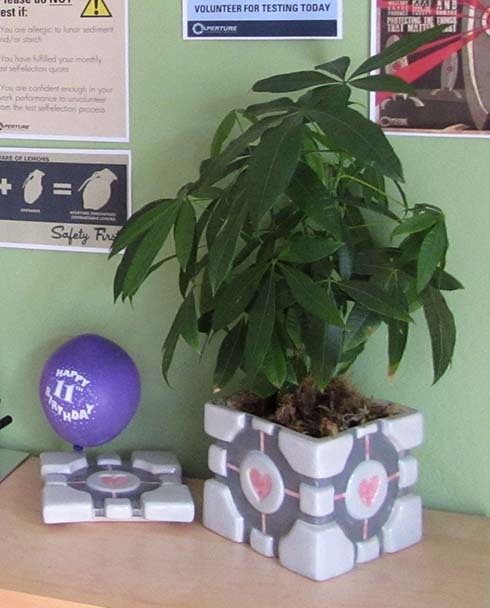 However, it does make a decent planter. 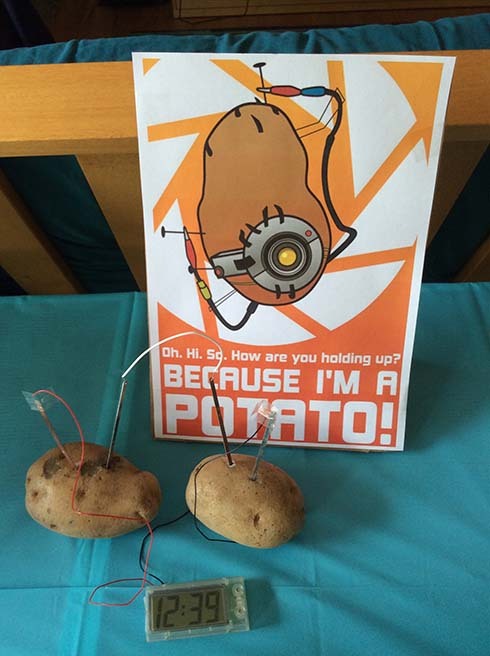 The GLaDOS quote/potato graphic is, or was, available on Etsy. The potato battery is, well, just a standard potato battery. 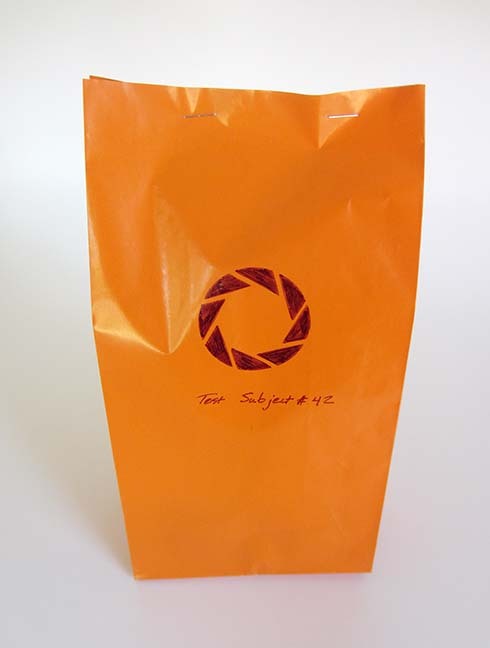 There actually is a company which makes GLaDOS-like potato batteries. Alas, I didn’t find out about them until a day or two before the party. Oh, lovely. My hand is going numb. Blasted shoulder injury. Will I finish typing this? Let’s see. I wanted some streamers, though. What’s a birthday party without streamers? Were there any streamers in Portal? Yes, as it happened, in Portal 2, GLaDOS obnoxiously plopped some confetti down a ceiling-mounted chute. Not quite streamers, but close enough that I could reasonably hang streamers and claim that it was sort of canon. I don’t think the chute in the game is called a Surprise Deployment Device, though. I sort of made that up in case the guests wondered what the box on the ceiling was about. Sigh. I guess I mommed things up after all. My metric for good party favors is whether the kids will have good, fairly innocent fun with them and the kids’ parents will barely speak to us once they see the contents of the bags. Things like whoopie cushions, gigantic rubber bands, homemade marshmallow guns. I thought about sending the kids home with homemade potato battery kits. How bewildering would it be to open the favor bags and find a couple of potatoes, some copper and galvanized nails, and other bits of electronics? I didn’t get all the stuff together, though, so that didn’t happen. 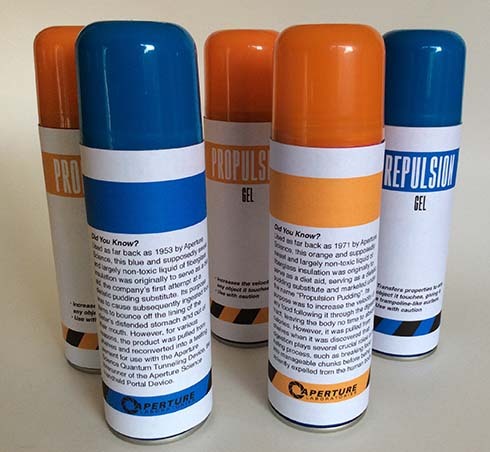 Cans of silly string rebranded as repulsion and propulsion gel. I got most of the text from the Portal and Half-Life Wikis. I’m sure the guests’ parents found it all deeply disturbing. Chocolate Companion Cubes – These were molded using ice cube trays from ThinkGeek. To make the cubes, I melted Nestlé white chips, filled a cube space about halfway, then shoved in a chuck of milk chocolate. 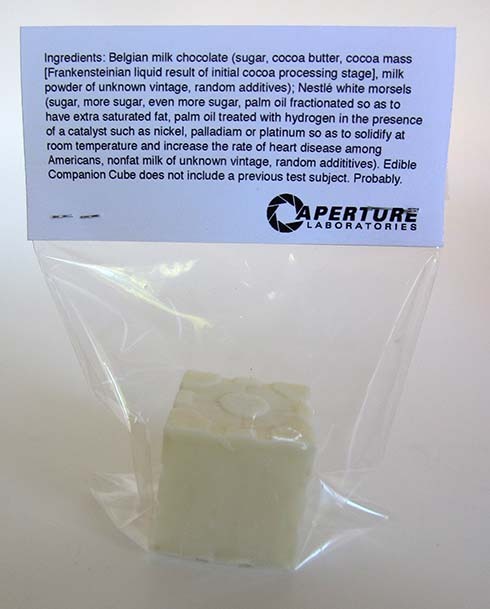 I then topped the milk chocolate off with more of the white goo so it was covered and the Companion Cubes appeared uniformly white. I doubt any of the guests discovered the milk chocolate inside, though, because the white chocolate/toxic Nestlé goo was so sickeningly sweet that it could instantly induce Type 2 diabetes. 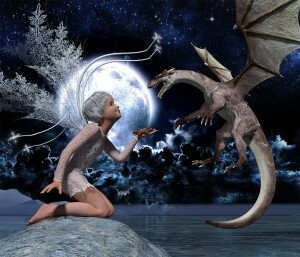 Miniaturized Handheld Portal Devices – Picture this. 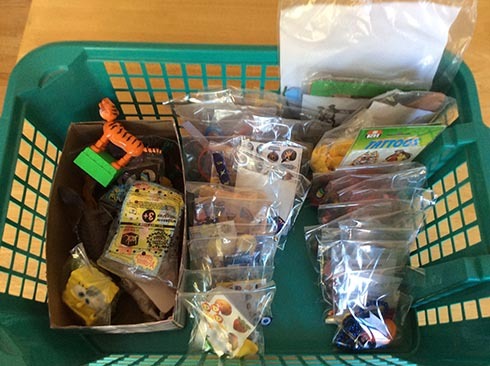 Your kid has picked out cheap 39 cent toys for the party bags. You don’t want to say no, because the things are only 39 cents and they look fun, but they aren’t really consistent with Portal cannon. So you slap a bogus label on them and toss them in the favor bag, kind of hating yourself because you’ve once again mommed things up. Ah, well. The kids seemed to have fun, or if they didn’t, they kept their yaps shut about it. They ate junk food and played video games for a few hours, then they went home. In another year, their parents will have forgotten about the stuff I sent home with them and we’ll throw another party. Maybe next time we’ll theme on Little Big Planet. 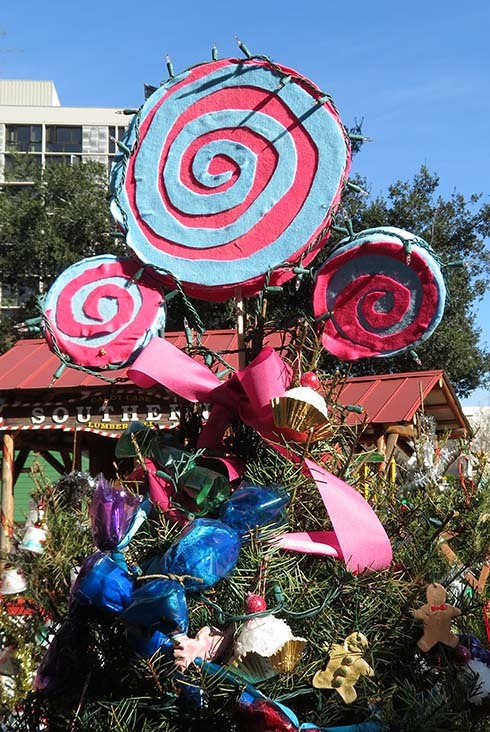 Sack people and prize bubbles everywhere … maybe a giant prize bubble piñata … yes … I can work with that. Whee! It’s vacation photo time! Who doesn’t enjoy looking at the photos of random strangers and acquaintances? 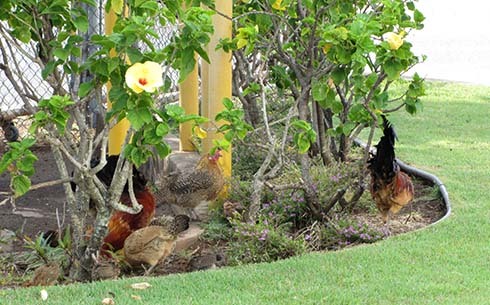 My family and I went to Maui a couple of weeks back, sort of a short notice adventure. All of us were incredibly stressed out, so we put the bird and the dogs in boarding, threw some toothbrushes and swimsuits in backpacks, and headed for the airport. These photos are in no particular order. Maybe that’ll spice things up. 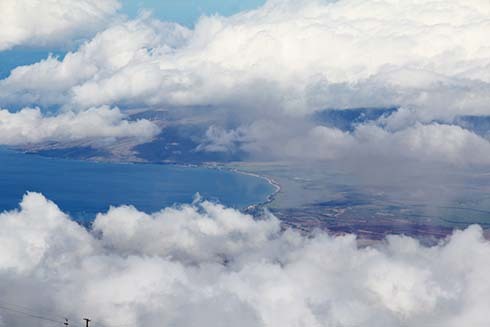 This one is of the western coast of Maui, shot from the top of Haleakala, more than 10,000 feet up. Note that we’re looking DOWN at clouds. 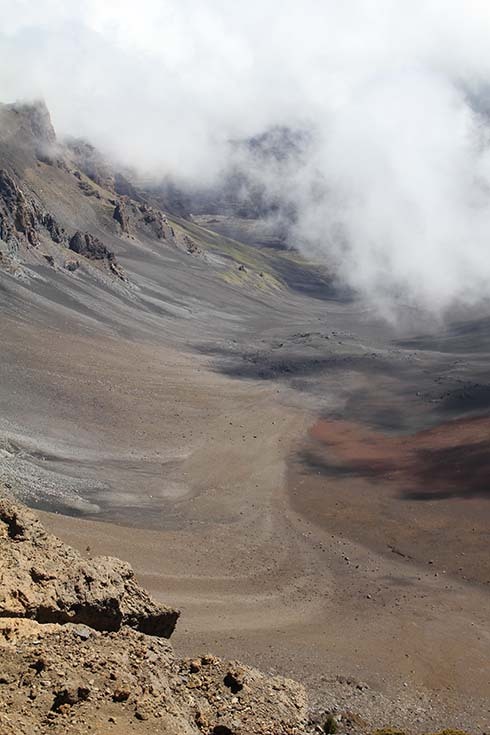 Looking into the crater at Haleakala. 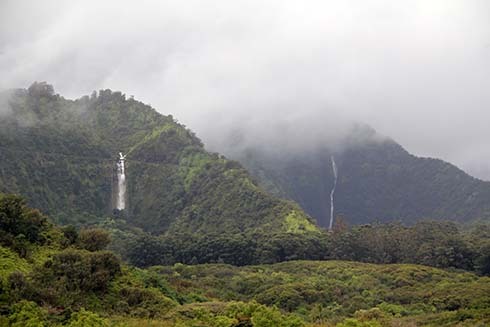 (Haleakala is a shield volcano.) 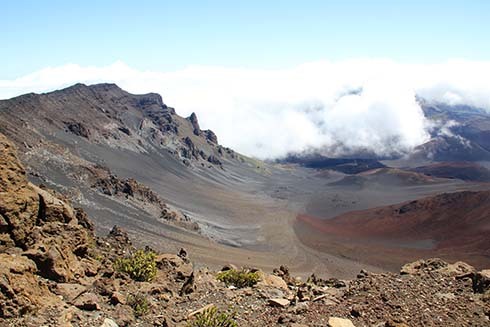 One can hike the crater, four miles each way. We didn’t, though. The altitude and the cold were a bit much. “I sure am glad we walk three or four miles a day,” I told my husband in a congratulatory fashion as we huffed and puffed to the top of one peak. Just then, a younger couple came piling past us with no trouble, each carrying a child. Jumping around a bit … Charles Lindbergh’s grave in Kipahulu, on the Hana coast. 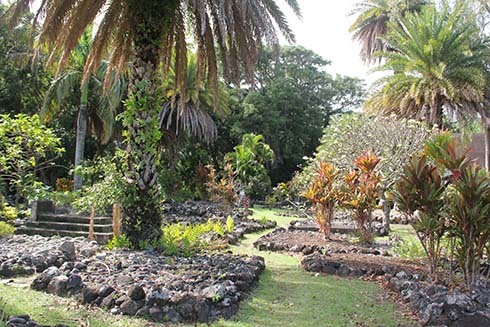 The graveyard at Kipahulu. It seemed rude to photograph Lindbergh’s grave without acknowledging the others. 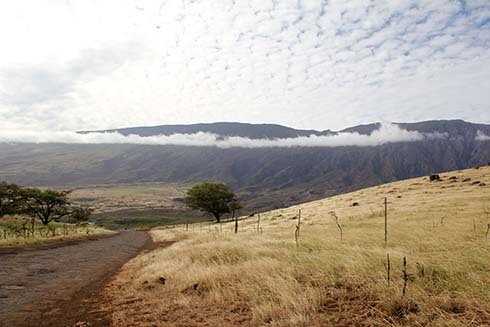 Driving on the south side of the island, edging around the base of Haleakala. 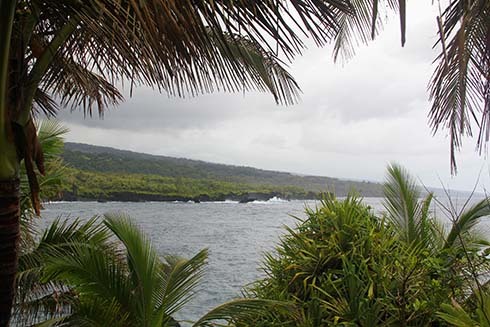 View of the coast from Kahanu Garden. Suddenly we’re back on top of Haleakala, staring down into the crater. I’m sure others have said the same thing, but I’ll say it as well: it was otherworldly. 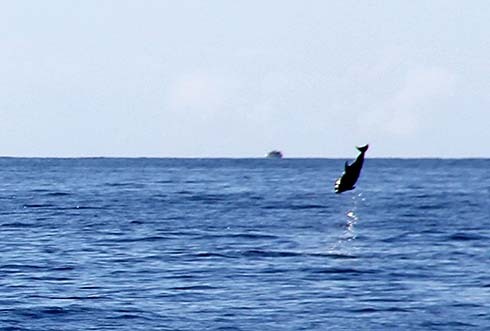 A bottlenose dolphin leaping gleefully into the air. At least, I assume it was jumping out of glee. Maybe it had a personal itch. 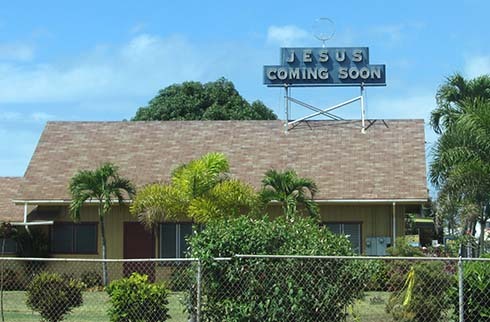 “Jesus Coming Soon”, signage on top of (presumably) a church in Lahaina. Very tasteful and subtle. 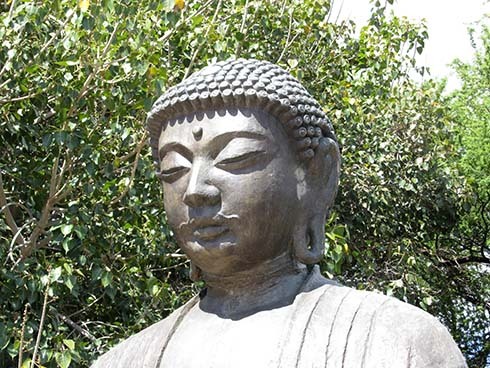 Just down the road from “Jesus Coming Soon” is the Jodo Mission, which purportedly has the “largest Buddha outside Japan.” Dunno; I haven’t gone around and weighed or measured all of them. 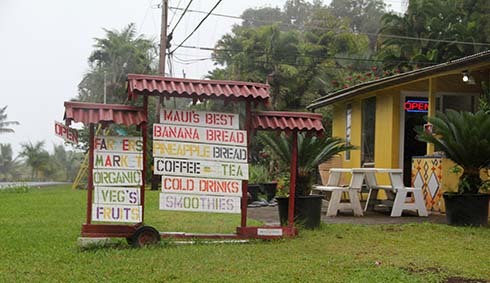 Seen on the Hana coast. There were a mind boggling number of waterfalls. It was almost literally the case that each time one would go around a jog in the road, there’d be an insanely gorgeous waterfall beside one’s car. Whee! 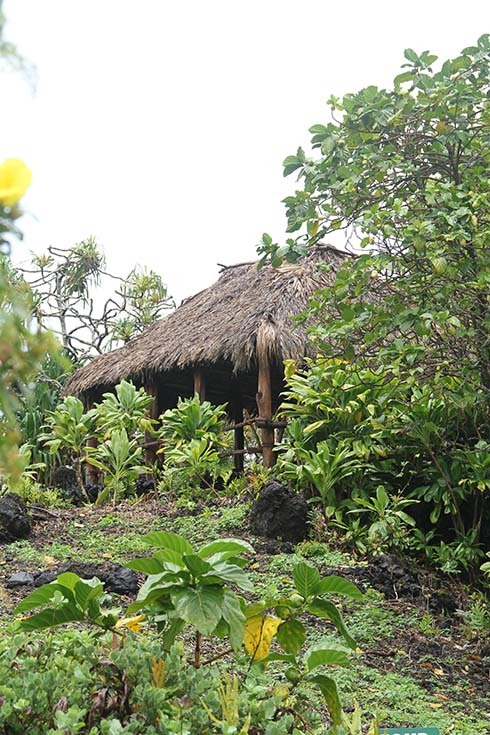 We’re back in Kahanu Garden, staring at a hut. Not sure what this one was meant for. My son used it as a place to shelter while picking grass from between his toes. 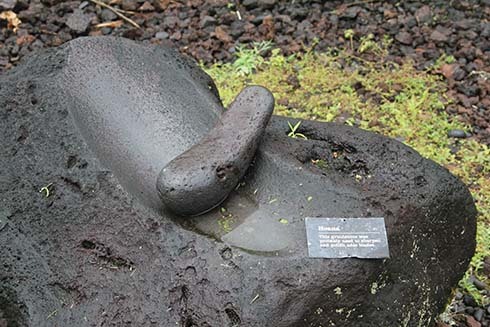 “Hoana – This grindstone was probably used to sharpen and polish adze blades.” Still in Kahanu Garden. 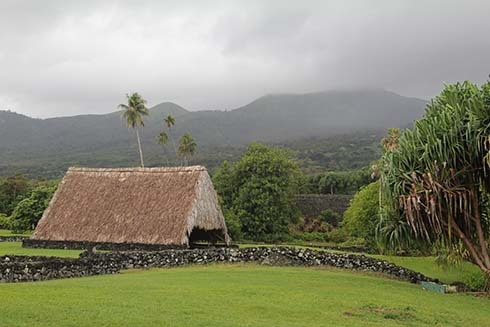 A fine view of the hills, a hale holding an outrigger canoe, and Pi’ilanihale Heiau, an ancient temple. Back at the Jodo Mission. 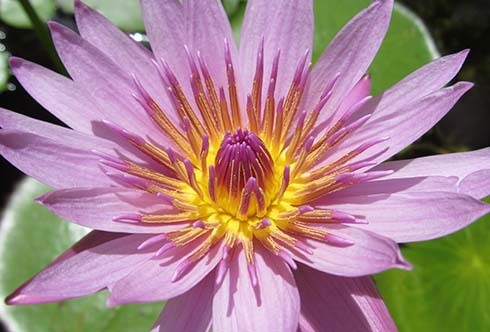 Lily pond at our hotel. The place was truly hellish, with five pools and a couple of water slides. While we were in Lahaina, a cruise ship docked. 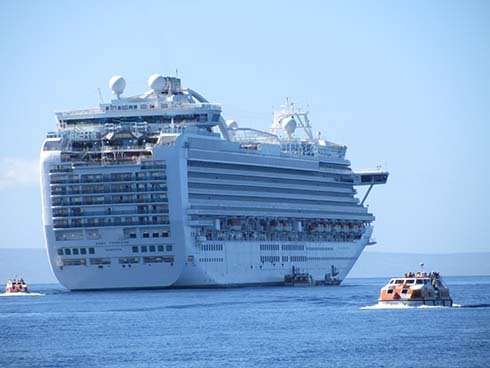 I nicknamed it “Princess Cruises: Scourge of the Sea.” Its passengers weren’t intentionally rude, I don’t think, but they were mindbogglingly oblivious. 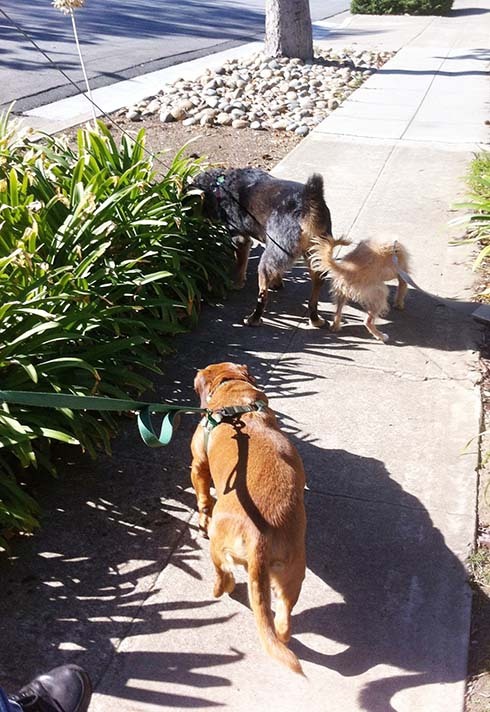 They gathered all over the place with their little blue cruise ship shopping bags, blocking sidewalks and restroom entrances, and seemed impervious to phrases like “excuse me”. On the positive side, many of them made me feel downright svelte. “Best banana bread?” Maybe. Or maybe they mean “Best Banana Bread” as a sort of brand name, not a claim. I didn’t care for it. It had the texture of a dishwashing sponge and an odd flavor. Perhaps local tastes are different. Me, I like to saute the bananas in butter and brown sugar before adding them to batter. 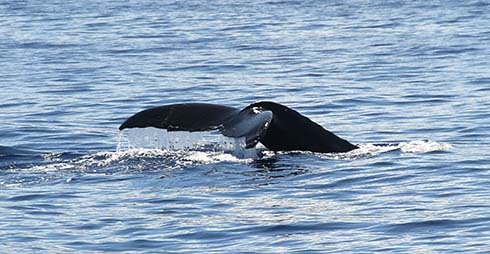 We saw many humpback whales, including a calf, his mother, and her suitors. Heard them as well. Marvelous. The last time I’d heard humpback whale song was on an LP my folks used to play while they’d pound alcohol. I much prefer the whales in person and without drunk people around. 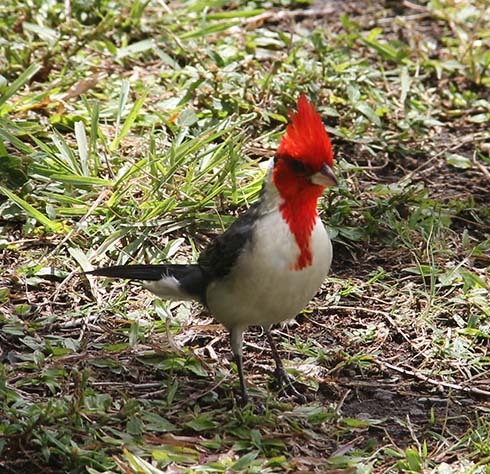 Gatecrasher at one of our picnics. No biggie. There are crumbs and fruit enough for everyone. 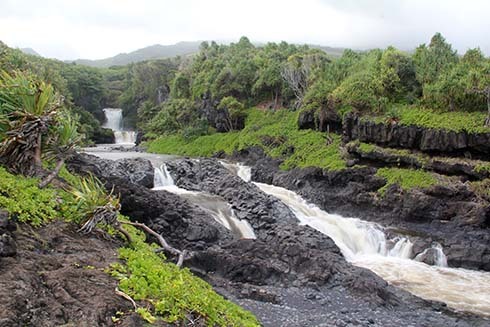 Waterfall on the Hana coast. 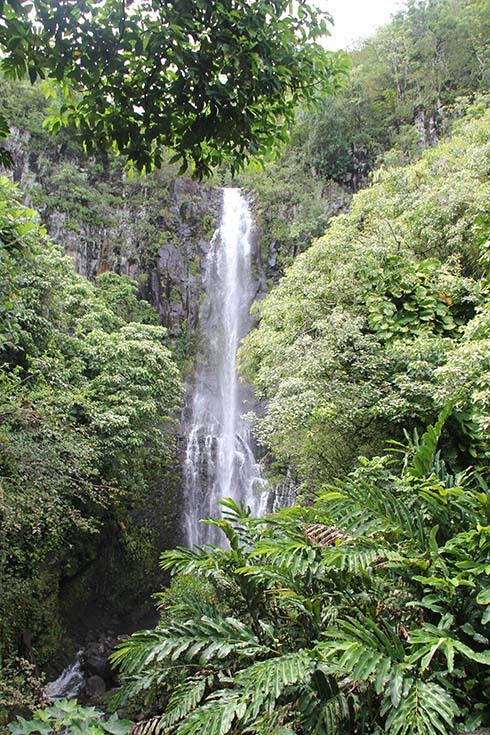 Yet another waterfall on the Hana coast. Truly a hellish place. 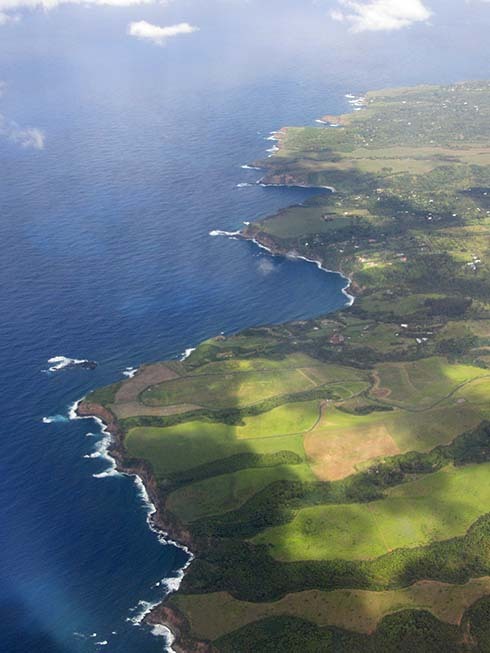 View of some coast or other from the air. 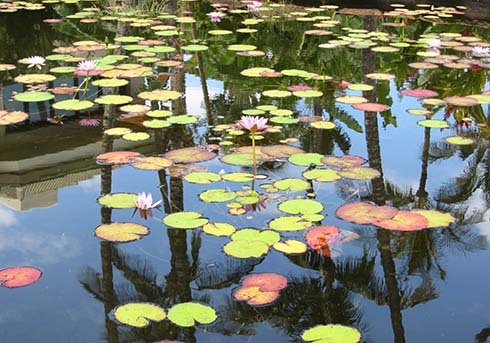 Lily pond at the hotel. We visited a whaling museum – or, as I liked to call it, “The Killing Museum”. I didn’t take too many photos. Turns out, after you’ve seen and heard whales in person, seeing the tools for killing and dismembering them is rather upsetting. 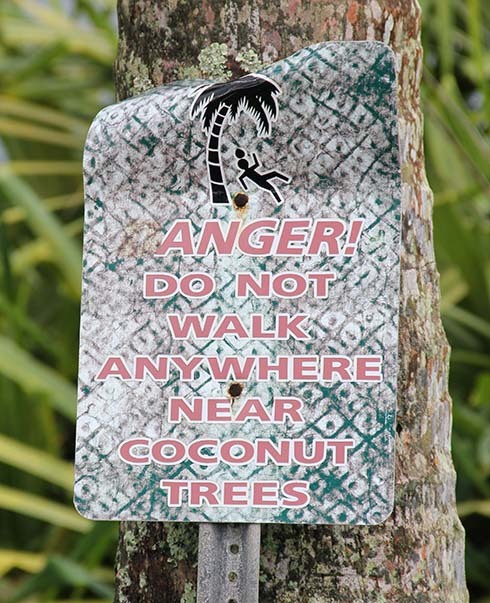 “Anger!” Clearly a modified sign, but I like the concept of angry coconut trees. My husband privately sneered when the park guide told us “more people are killed here by falling coconuts than by sharks”. 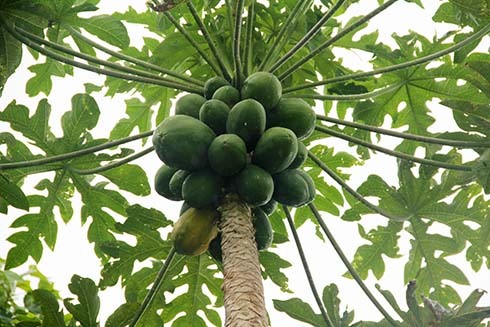 “We had coconut trees all over the place when I was a kid. Nobody ever got hit by a coconut!” I didn’t argue with him, although I did quietly wonder whether the umbrellas we’d been issued would deflect an angry coconut. A gecko at the hotel. I bent over sideways and tried in vain to get the creature to climb on to a convenient bit of shrubbery. It refused, and in fact snuck across my back where I couldn’t reach it. “Do you need help getting it off?” the attendant asked, “It seems to like you.” “Well, I guess I was better than the alternative of drowning.” “It was sweet of you to save it,” he replied, in a tone of voice which implied just the opposite, a tone which implied that he frequently sees geckos and they’ve gotten on his nerves, maybe started haunting his dreams even, and it would be nice if all the damned things drowned in a swimming pool. 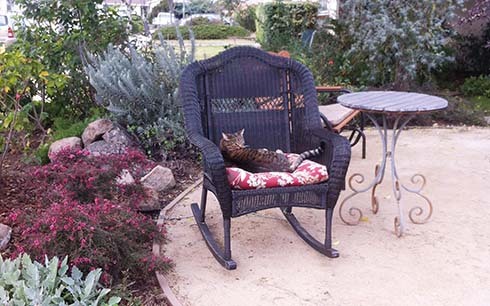 Nevertheless, he pried the gecko off my back and put it in the bushes. “That was good luck,” my husband informed me later, “saving a gecko is good luck.” He isn’t normally a superstitious person, but geckos are evidently a different matter. 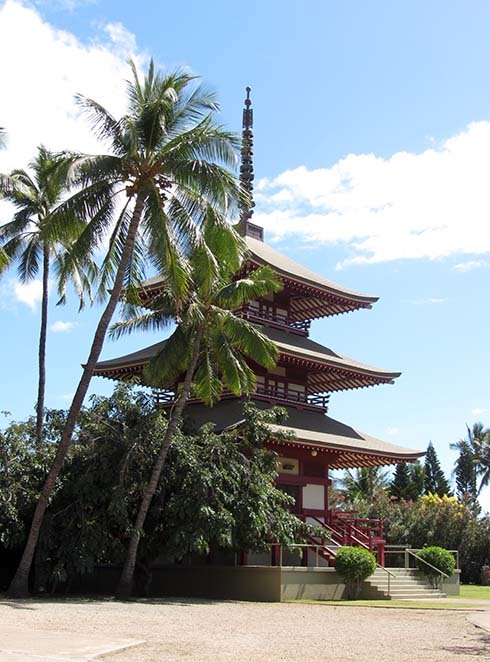 He lived in Oahu as a child; some local beliefs must have seeped in. 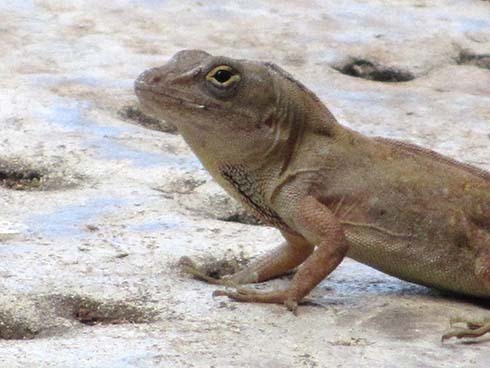 Later, while I was sitting outside by a lily pond, another gecko came tooling along the sidewalk and paused to study me. “Watch out,” I told the gecko, “People are coming. They may step on you.” The gecko moved away from the center of the sidewalk, then skittered toward me. “You have a nice face,” I informed it, then took the photo above. The gecko bounced up and down a couple of times, then ran into the bushes. I think I already got a good dose of luck when I married him. A couple of weeks ago, after dropping my kid off at a Laser Quest birthday party, I ventured across the street to the Computer History Museum in Mountain View. It’s a marvelous place, the Computer History Museum, and if you’re ever in the Bay Area and have any interest in computers, I urge you to visit. Their exhibits span the range from slide rules to robots to modern day computers, with many pit stops in diverse topics such as punch cards for weaving Jacquard, guided missile systems, and video games. While other museums may have ‘a’ something-or-other, such as ‘a’ key punch machine or ‘a’ Babbage Difference Engine sandwiched in with other science exhibits, the Computer History Museum has a broad range of ‘a’s and ‘the’s. As in “Wow. That’s the original Pong Machine that Al Alcorn stuck in a bar in Sunnyvale, complete with crooked name plate.” Or: “Wow. That’s a chunk from the ENIAC.” Plus there’s a neat gift shop with nerdy stuff. 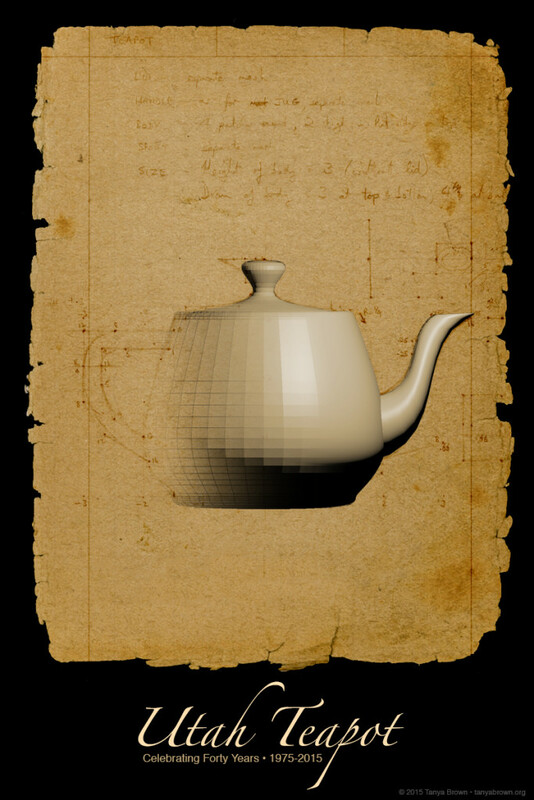 One of the museum’s ‘the’s is the Utah teapot, the one digitized by Martin Newell back in 1975. Holy cow! 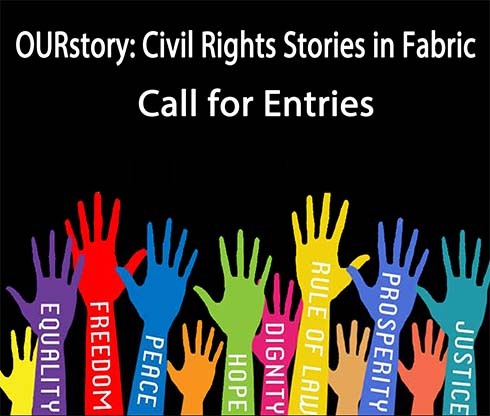 Has it really been forty years? Well now, that’s something worth celebrating, so I did. I came home and whipped up the graphic above, which is based on Martin Newell’s original pencil sketch of dimensions and a rendering of the resulting model. Oh, and I may have used some artistic license as far as aging the paper and so forth; I wanted to call to mind da Vinci’s Vitruvian Man. 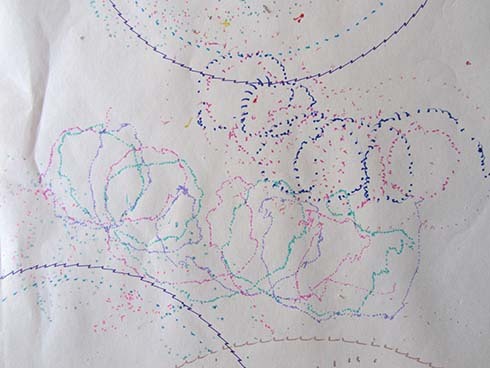 In reality, Newell’s sketch is very tidy, executed on decidedly unstained quadrille paper. Happy birthday, Utah teapot, and a big thank you to Martin Newell for sharing his work with the world. The Utah teapot is something of an icon to those who work with 3D graphics. As the story goes, back in 1975 when Martin Newell was “a member of the pioneering graphics program at the University of Utah”, he needed a “moderately simple mathematical model of a familiar object for his work.” He was having tea with his wife at the time, and she suggested modeling their tea service. He did and, in addition to using the teapot for his own work, shared the data set with others. The rest, as they say, is history. 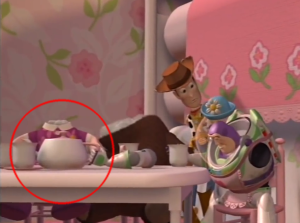 Since then, the teapot has become a beloved icon to many of us and something of an inside joke. 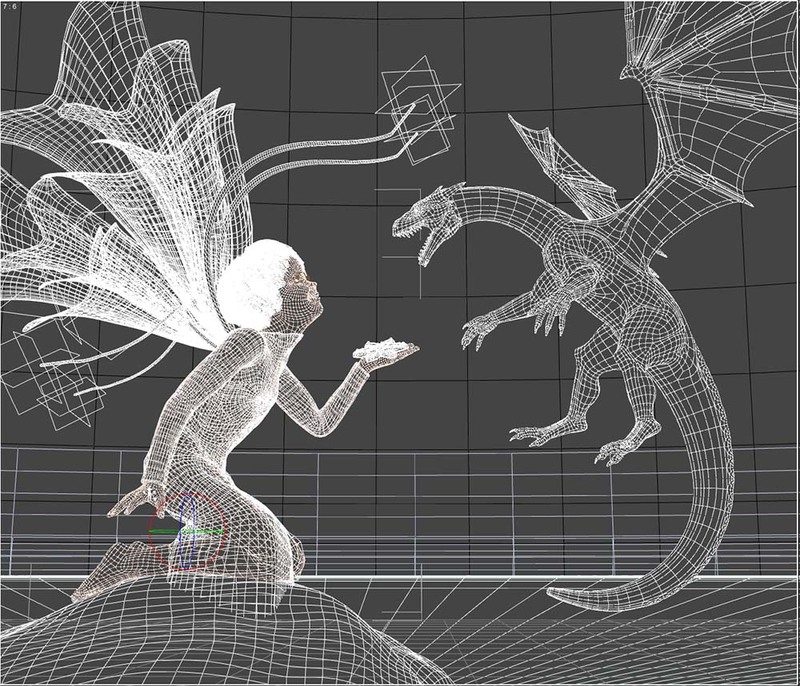 It has appeared everywhere from test renders to papers submitted to SIGGRAPH to films such as Toy Story and Monsters Inc. 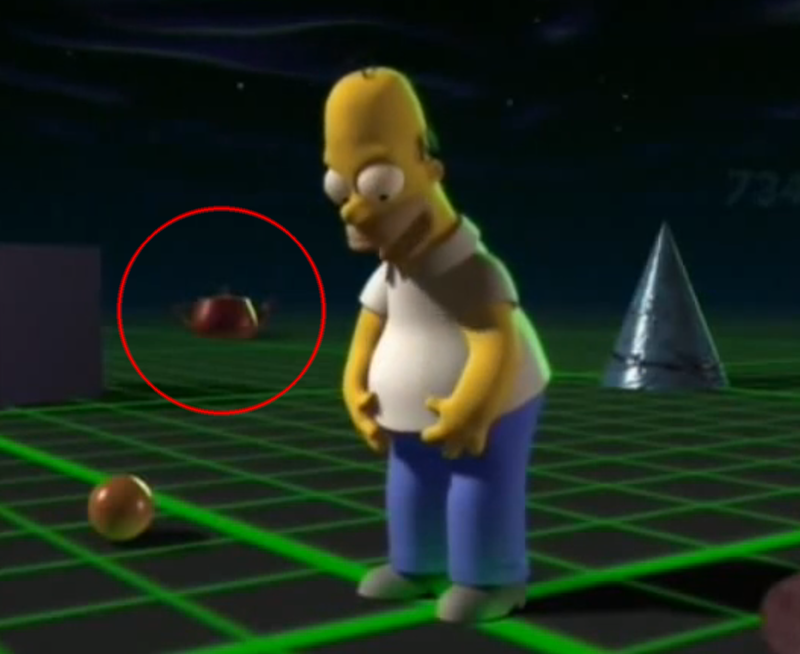 Even Homer J. Simpson has had his teapot moment! Not bad for a humble white teapot purchased from a department store. The teapot is of course not Newell’s only accomplishment, just the one most familiar to many of us. He’s had a long and productive career. However, it’s a bittersweet fact of life that we don’t get to choose the manner in which we’re remembered, if we’re remembered at all. 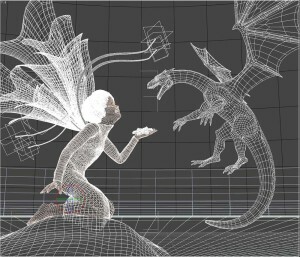 Per Tom Sito’s Moving Innovation: A History of Computer Animation, “When Newell spoke at a SIGGRAPH conference in the late 1980s, he jokingly confessed that of all the things he has done for the world of 3D graphics, the only thing he will be remembered for is ‘that damned teapot’”. I think I could make my peace with that.